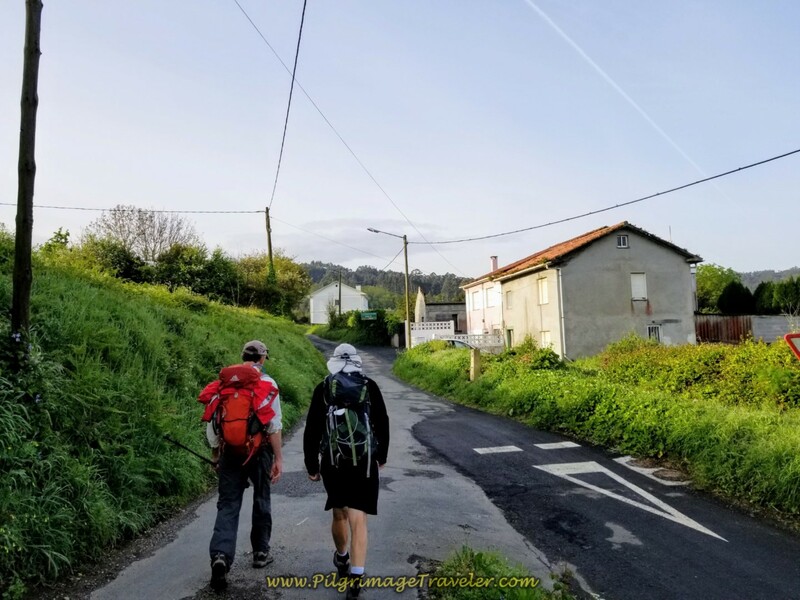 Day two on the Camino Inglés is a nice, but mostly uphill walk through the historic medieval town of Neda and onward over the hills, to cross the Eume River into another medieval town of Pontedeume. 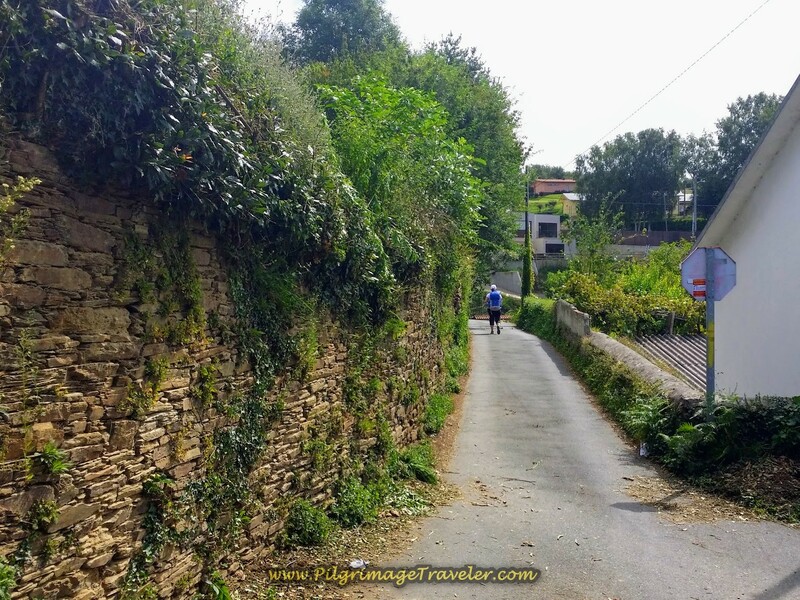 While short in length, the climb is significant and not to be underestimated. 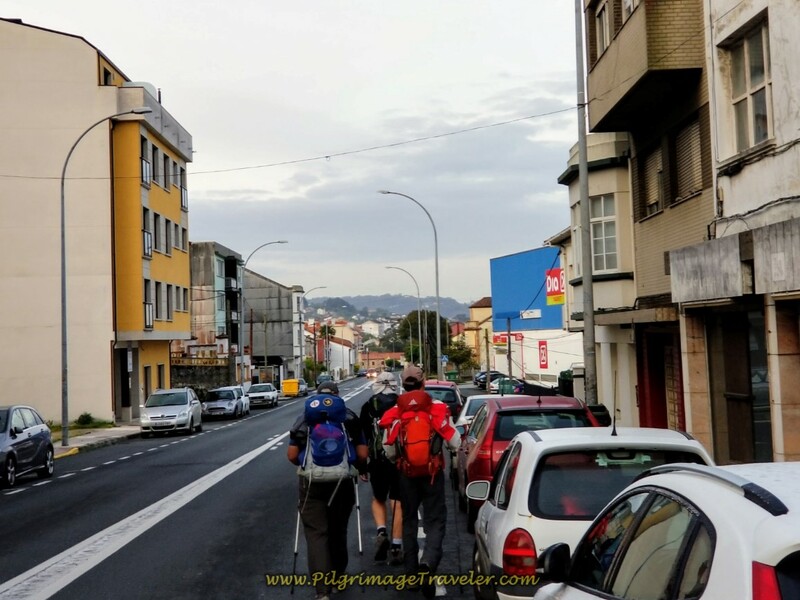 Our foursome continued onward from the albergue in Neda, making it to Pontedeume in fours hours. 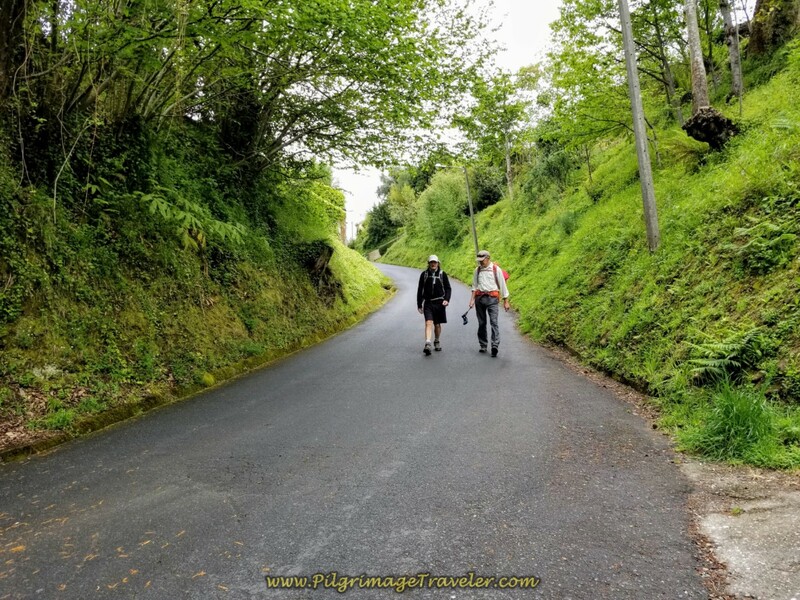 We chose to continue on and complete the next stage to Miño, shown in day three, for a very strenuous and hilly 25 kilometer day. Read on to make you own choice wisely, according to your own desires. 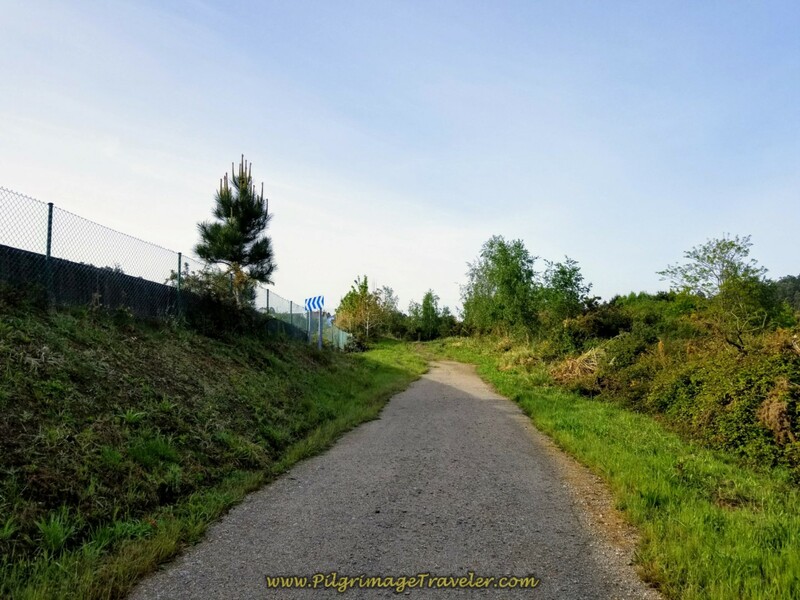 Here is our Google map of day two on the Camino Inglés. 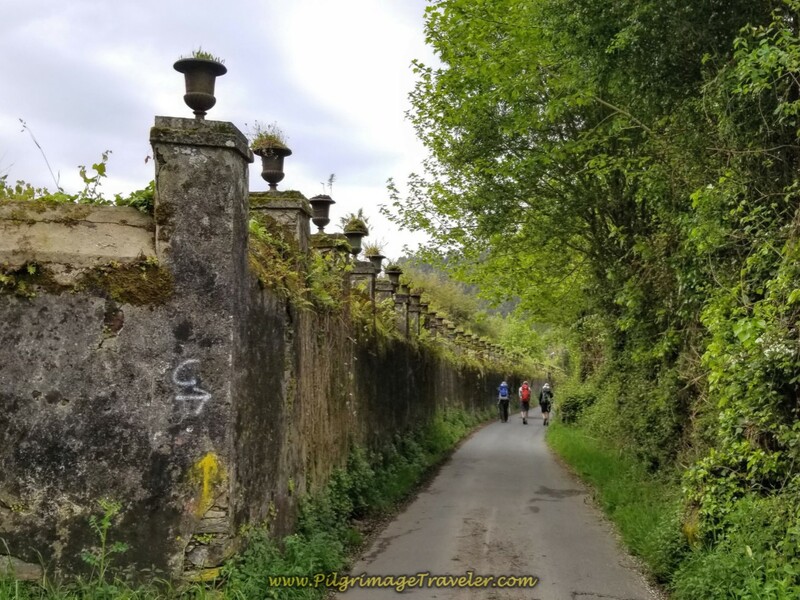 I have added many places of interest ~ hotels, albergues, cafés and supermarkets, to assist your Camino. Here is the elevation profile for day two. 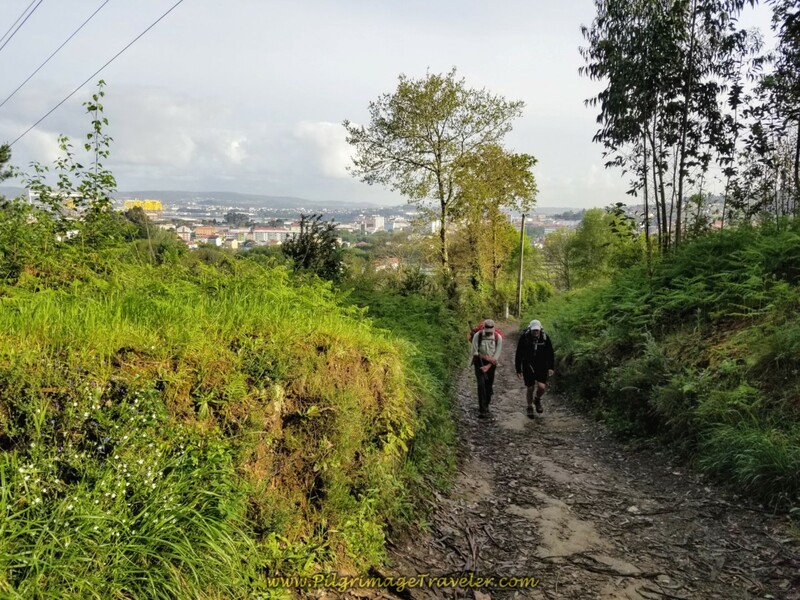 A small hill climb, followed by a long and steep climb for a total elevation gain of 386 meters (1266 feet) is the essence of the day! 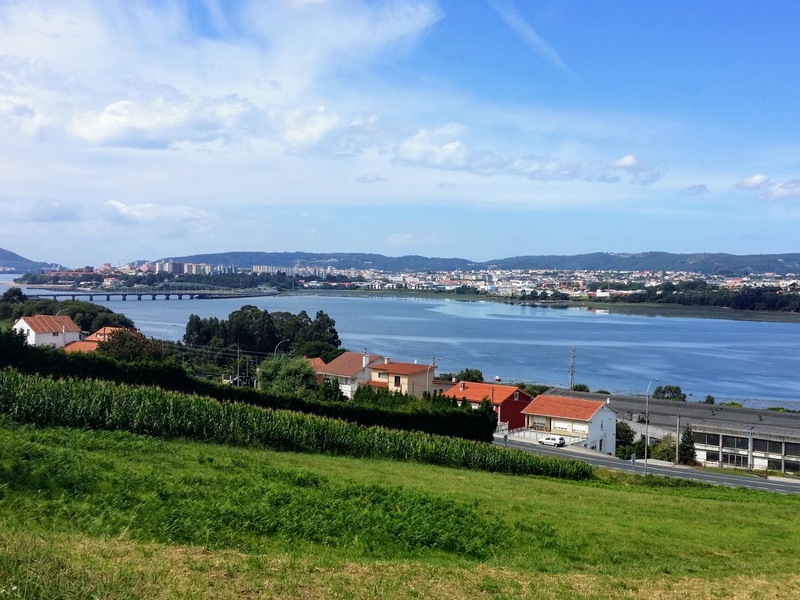 It was a crisp and clear morning along the Ferrol estuary as we set out from the Albergue de Peregrinos de Neda. 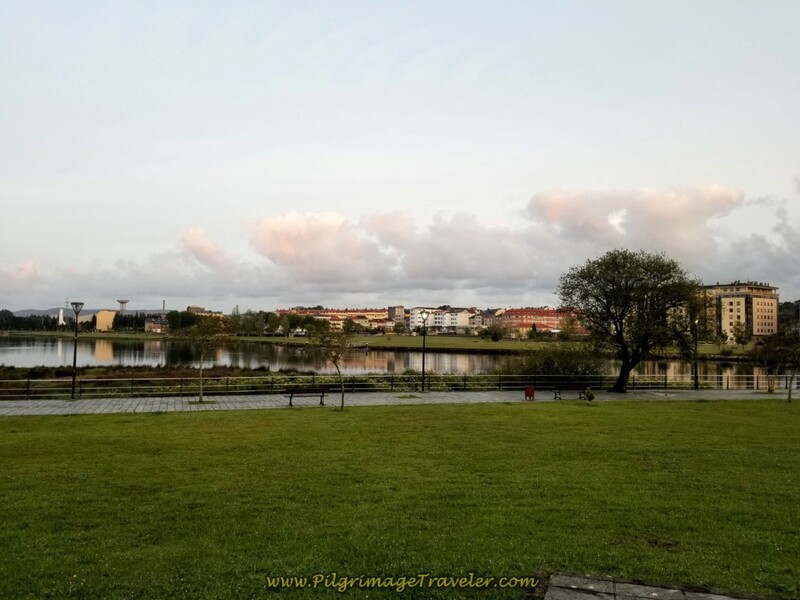 The rain from day one had cleared out and the view over the river was calm and most beautiful. We had sufficient food to prepare ourselves a substantial breakfast before setting off for our day of hill climbing! 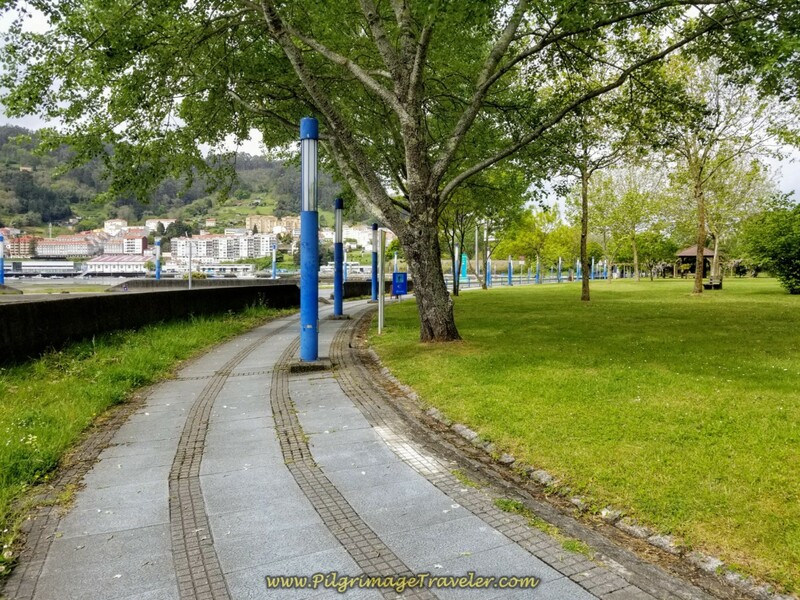 In the past, the Way continued on the promenade along the river, but the route was changed in 2017 to instead take the alley behind the albergue, to the south, and climb up the hill, turning right onto the street called the Aldea Empedron. 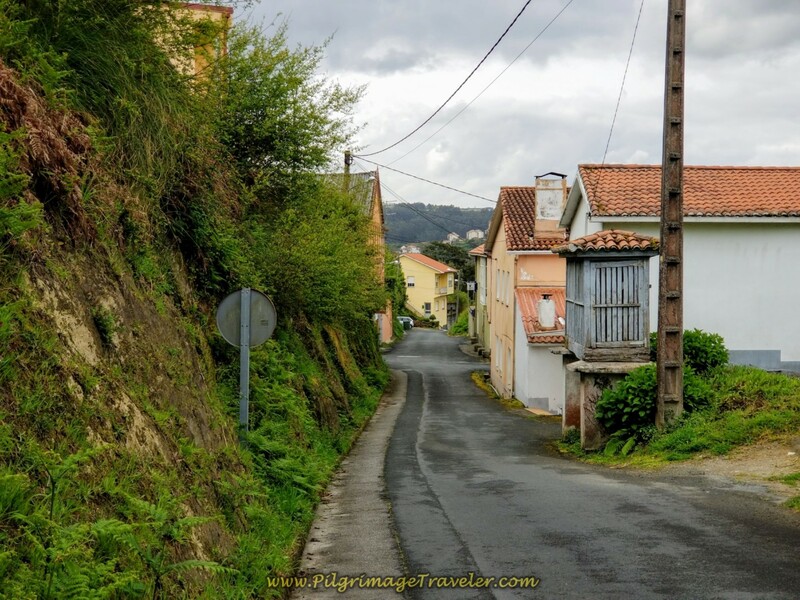 The street was still wet from the rain as we climbed up towards the main road, the AC-115 through town. It is only a few hundred meters before the Way joins the AC-115. 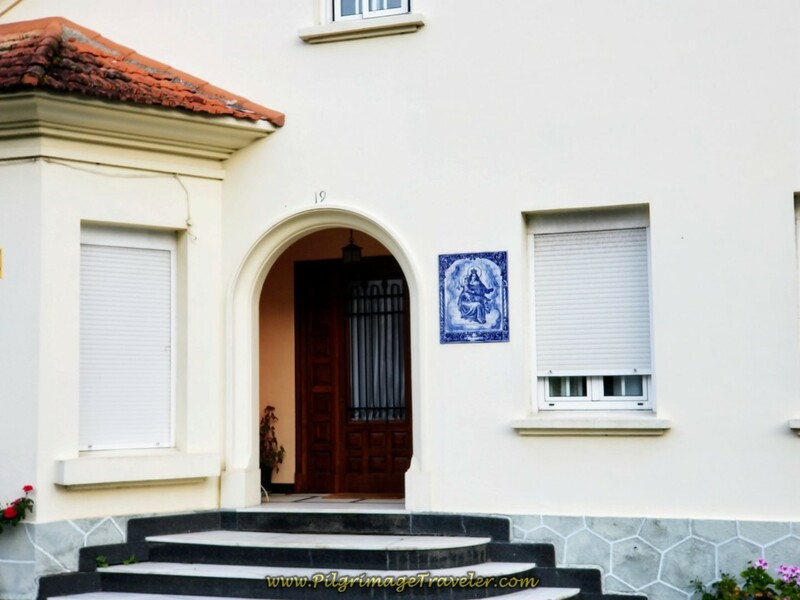 As we walked along the main road, I spied a beautiful home with a blue mural of Fátima. 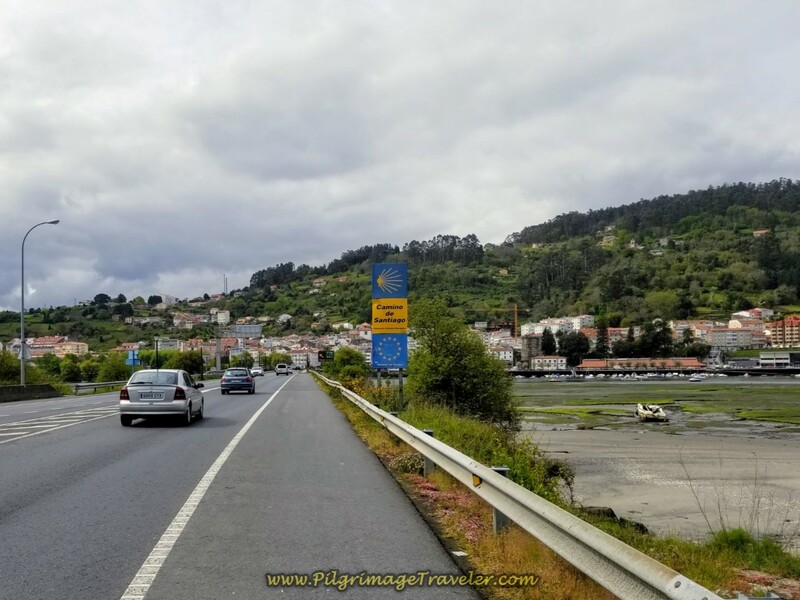 For a moment I thought I was back in Portugal, on one of the Caminos there! 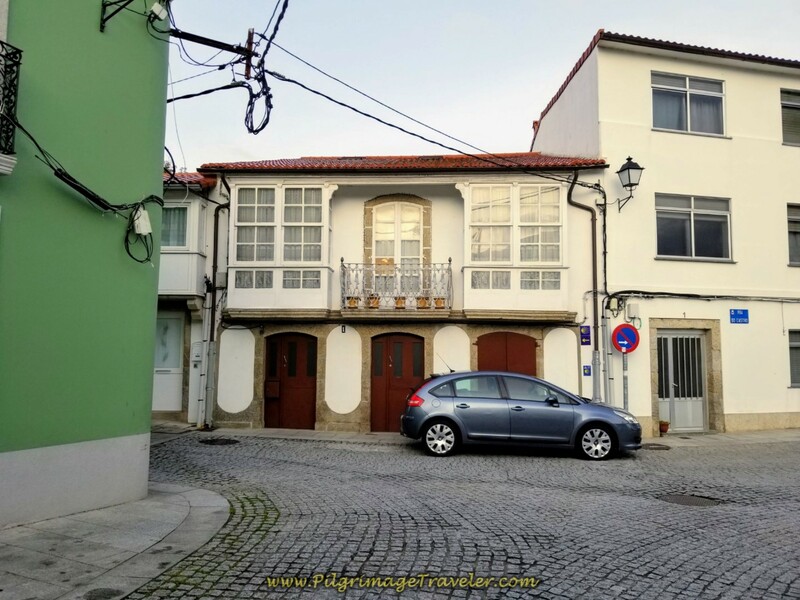 The Portuguese influence in Galicia cannot be understated. Fátima is the patron saint of Portugal, if you are unfamiliar with her. You can read about her by clicking here. Farther along the main road you come to a giant supermarket, the Dia. You can see it the photo, the building with the bright blue roof. If you desire supplies you can stock up here. There are sufficient cafés, however on this leg to Pontedeume, so you don't have to carry food if you don't want. 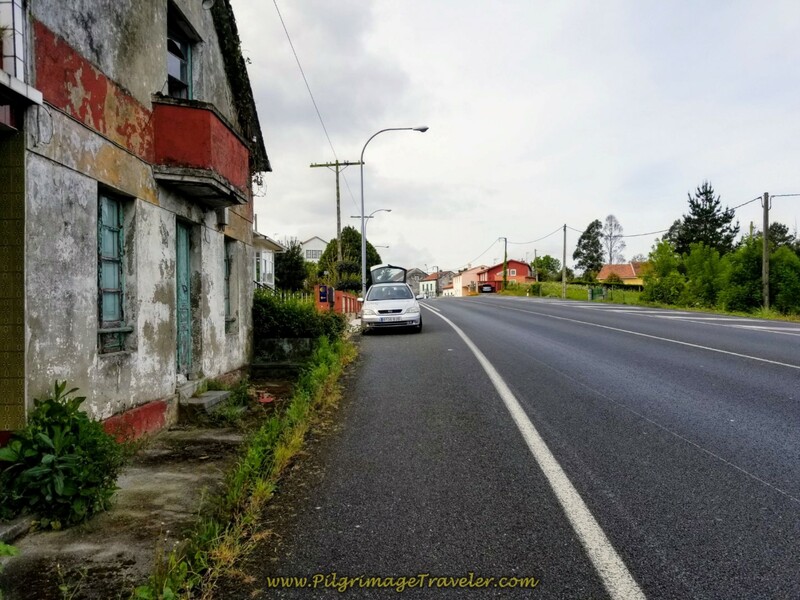 When possible, the Camino planners keep you off busy roads, and for a few meters, you are diverted onto this side street, paralleling the AC-112. 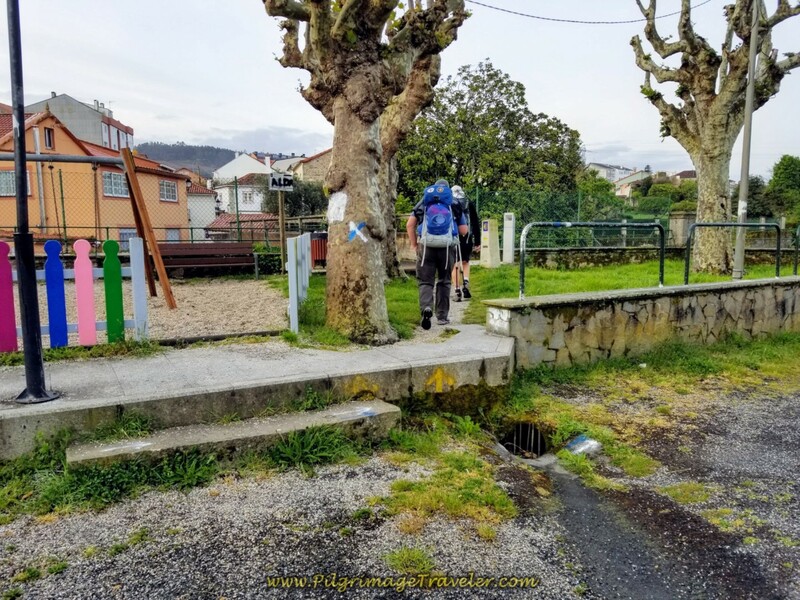 You must walk on the AC-115 for not quite a full kilometer before coming to the backside of the Iglesia de Santa María de Neda where you turn right towards the church. 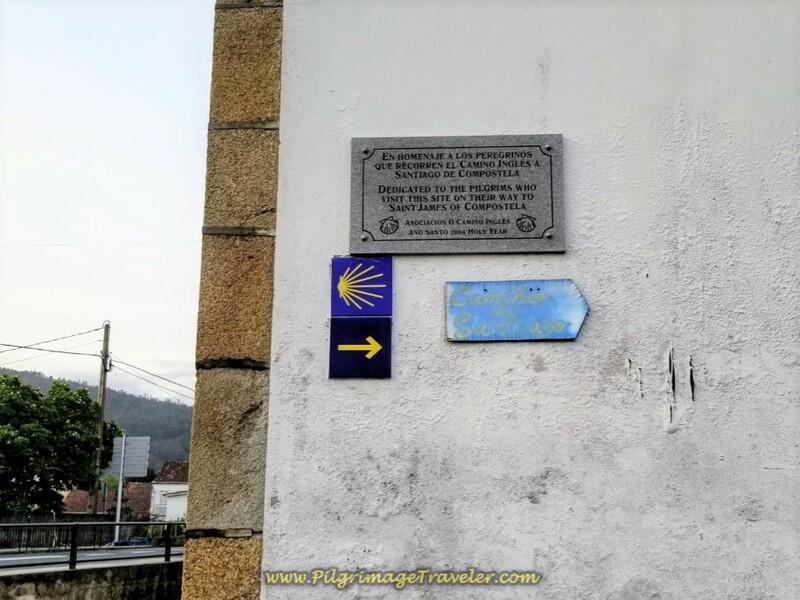 On the church's wall is a plaque, shown below, that shows a dedication for all the pilgrims on the Camino Inglés, on their way to Santiago de Compostela. This plaque was placed here in 2010, to commemorate the Holy Year. A Holy Year is whenever St. James Day, which is July 25th, falls on a Sunday. The next holy years will be in 2021, 2027 and 2032. The holy years are a very special time with special events and celebrations. 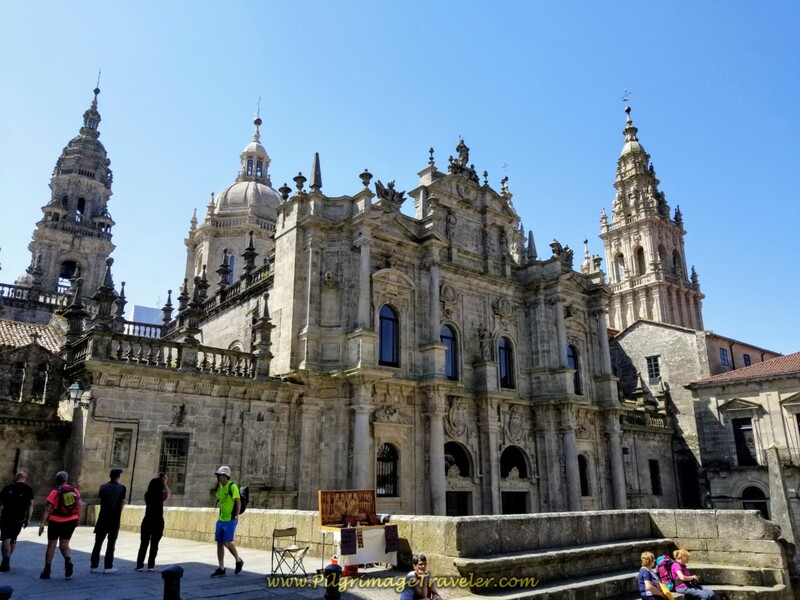 The Cathedral in Santiago grants plenary indulgences and a special door is opened, called the Puerta Santa (Holy Door), for pilgrims to enter from the Plaza de la Quintana. Follow the yellow arrow around the back of the church to the front side, shown below. Look opposite from the front side of the church and you will see a yellow arrow leading you by a playground, shown below. 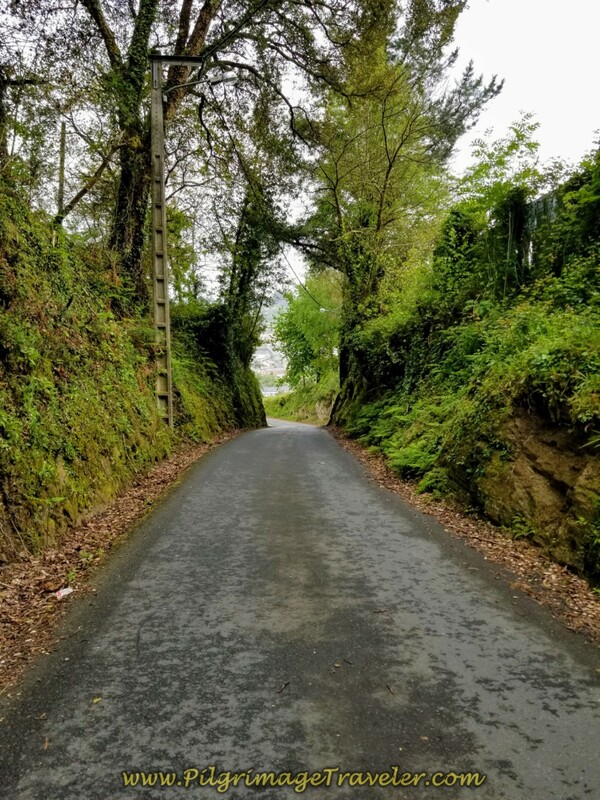 This takes you on a few meters short cut to the main road called the Rúa Real and onward through the old medieval town of Neda. 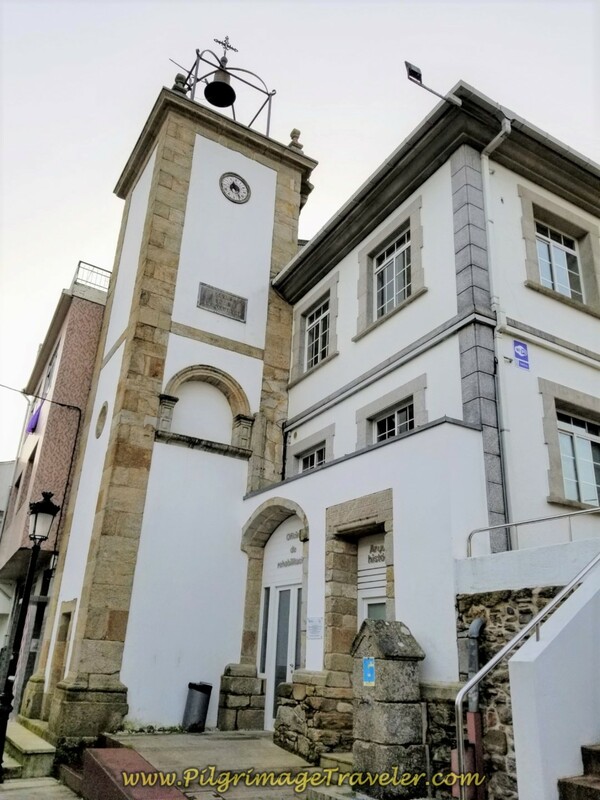 The first place of interest that you come to along the Rúa Real in the medieval town is the former pilgrim hospital, now converted into the Neda town hall. According to the Confraternity of St. James, this was known as the Hospice of the Holy Spirit in medieval times. It has an attractive clock tower that you can see, and if you look closely, there is a fountain below the blue sign, that has potable water if you need a fill up. We passed by a café close to the end of the Rúa Real, called the O Recuncho, but it was closed up tight this early in the morning. 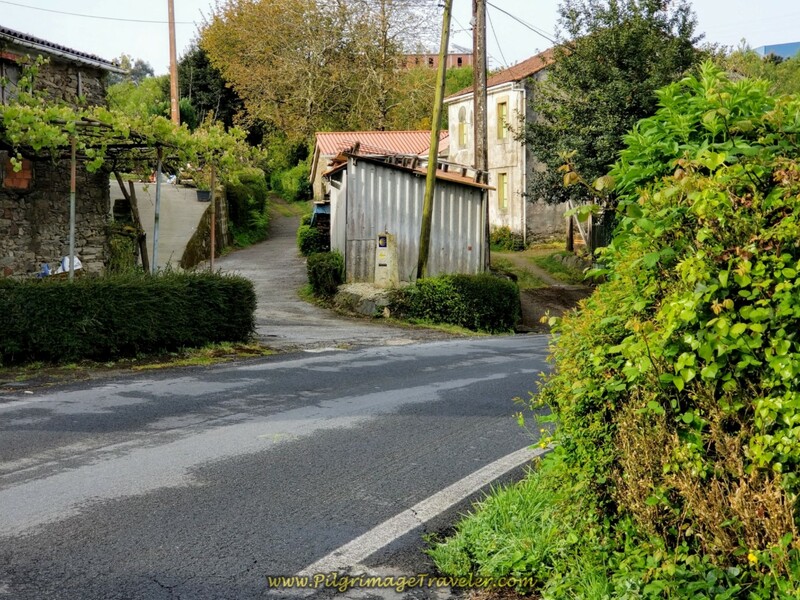 It is a short 1/2 kilometer through the medieval town, when just beyond the café you come to this T-intersection, below. 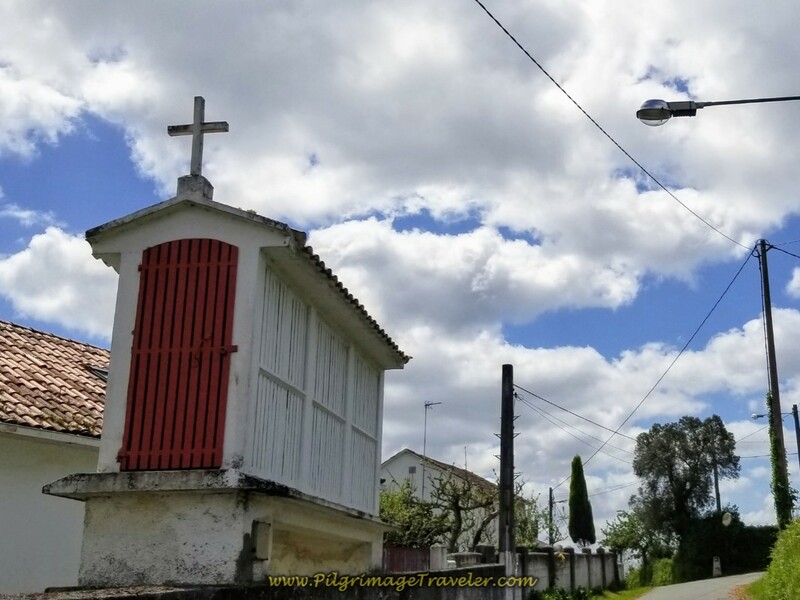 The Camino goes left, but if you walk to the right a hundred meters toward the waterfront you will see the 14th century church, the Iglesia de San Nicolás. Unfortunately, I didn't know about it, so we turned and walked onward. Thus ends the jaunt back in time. Then its straight onward for approximately another 600 meters, before coming once again to the AC-115, and turning right onto it. 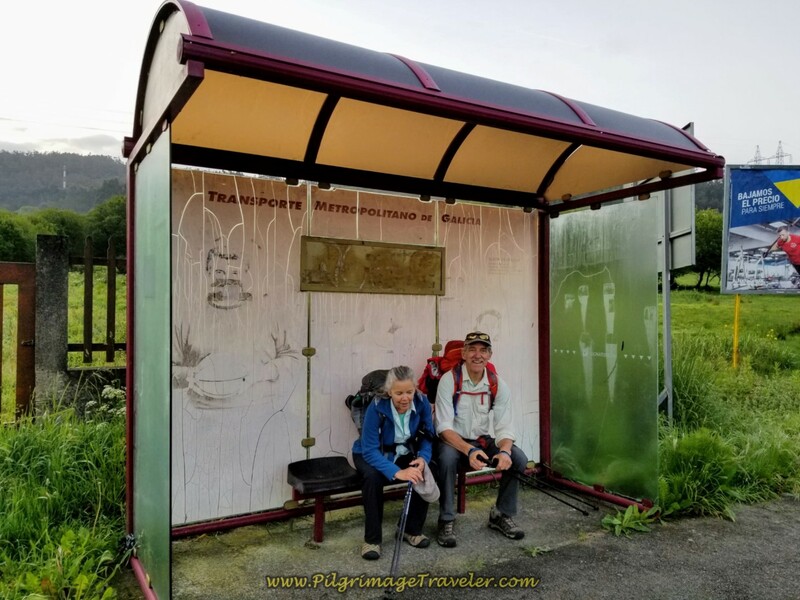 We are joking around at the bus stop where you turn right, pretending we were heading back to Ferrol on the bus! The Way does not remain on the AC-115, but immediately takes a side road to the left. In 100 meters or so it bears to the right, to begin the first climb of the day. First it is up to the bridge that crosses over the E-1, as it comes from the other side of the estuary. You can see the viaduct across the estuary in the photo below. We passed by this bridge on the other side, and you can see from our map how we have been circumnavigating the very long estuary. After the bridge over the E-1, the climb steepens significantly. 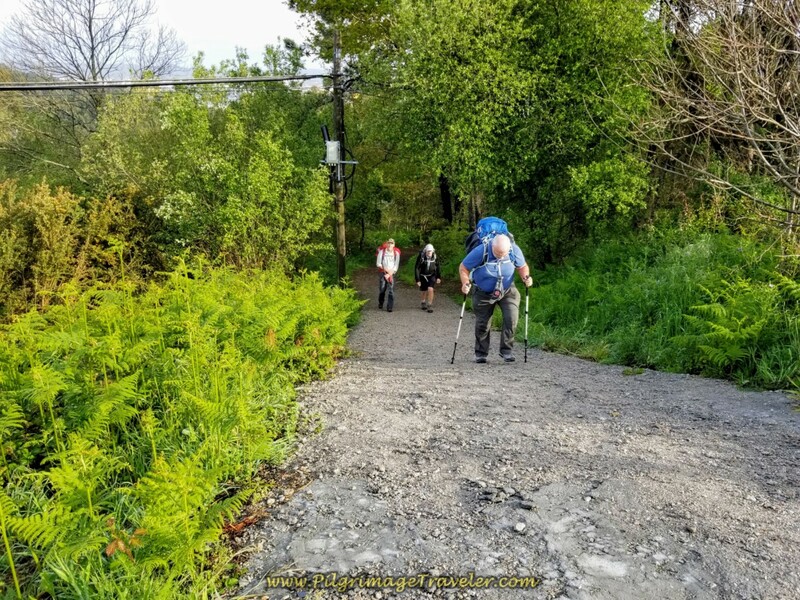 Below is Rich and Rob negotiating the steep pavement. 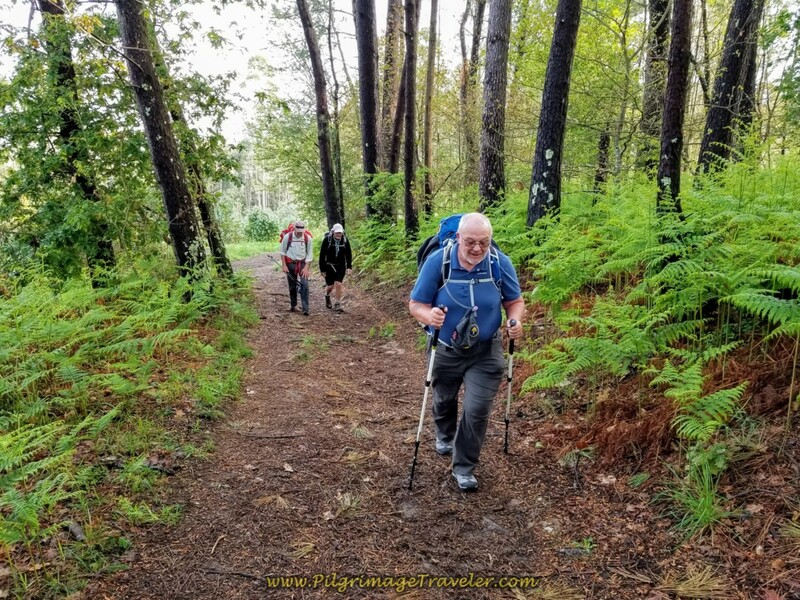 I ran ahead to photograph the climbing pilgrimage travelers, Rob, Rich and Steve and get a shot of the view that no one bothered to look behind them to see! It is a mere 1/2 kilometer climb to the top, so take heart! 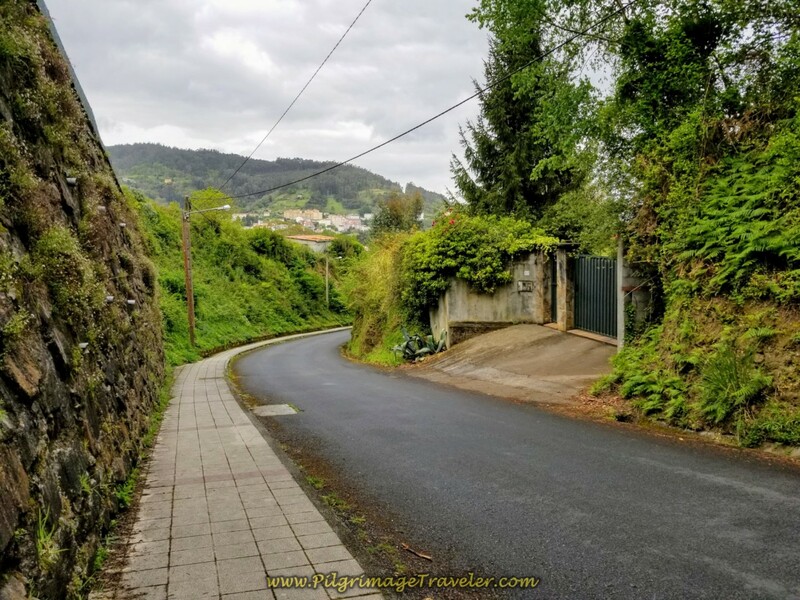 The top is at this next T-intersection, where the Way goes to the right, onto the Aldea Silva, shown below. 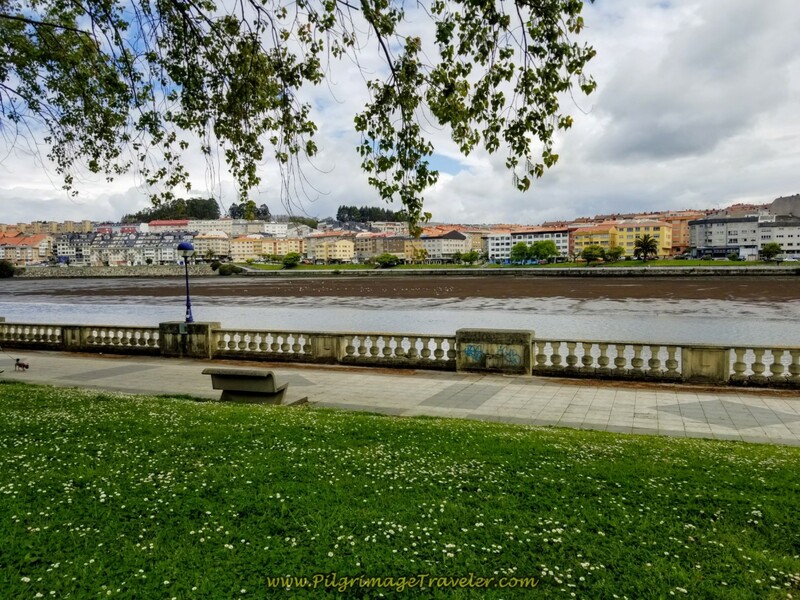 It feels quite flat to walk along the Aldea Silva, a sort of high shelf road, where the lofty views of the Ferrol estuary kept my eyes full of wonder for a long while! 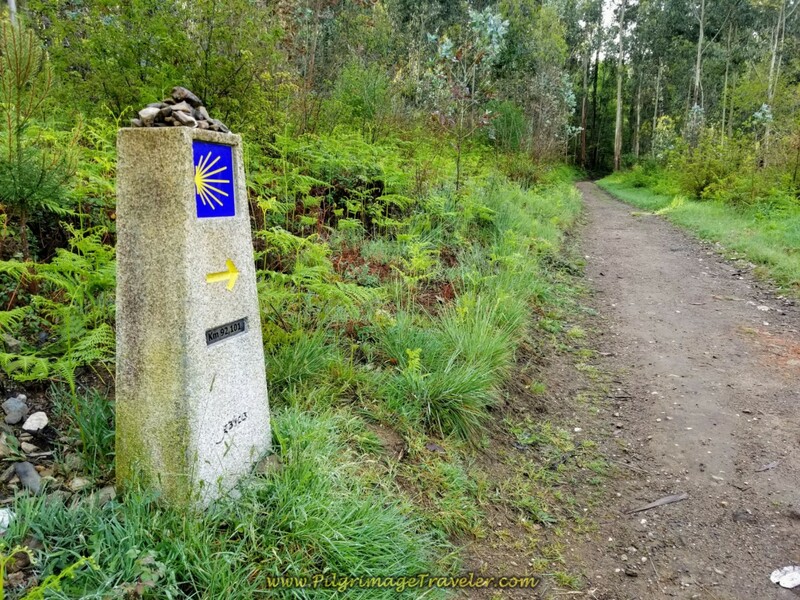 In 1/2 kilometer, follow the kilometer marker to the left and onto the Aldea Conces, below. The nice views continue for awhile longer. 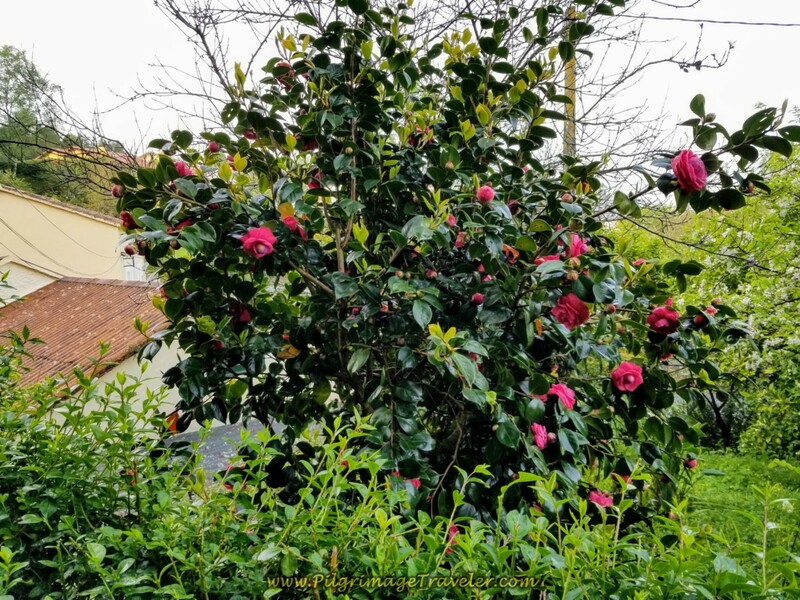 Spring was in full bloom on day two of the Camino Inglés and it was never evidenced as much than with this gorgeous Camellia tree. We were to see many more of them along the English Way. 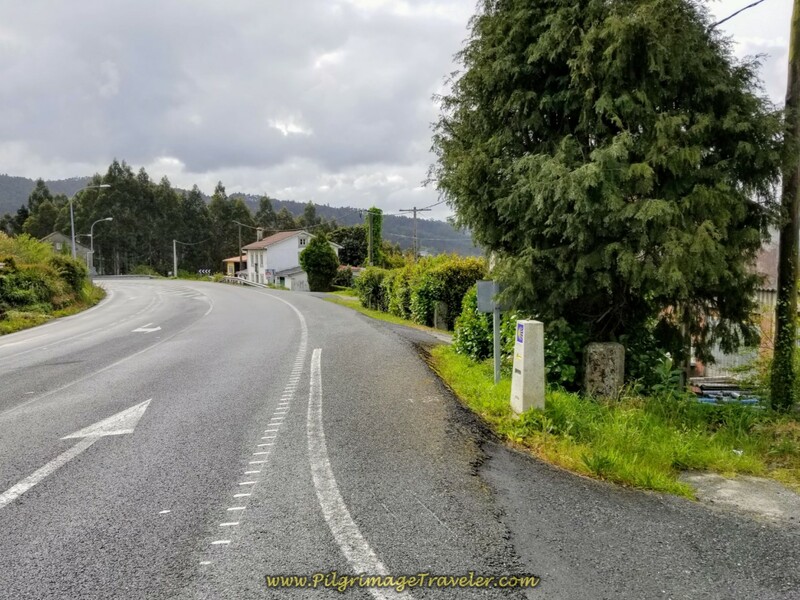 In 300 meters from the start of the Aldea Conces, we came to the road sign stating that we were entering the municipality of Fene. 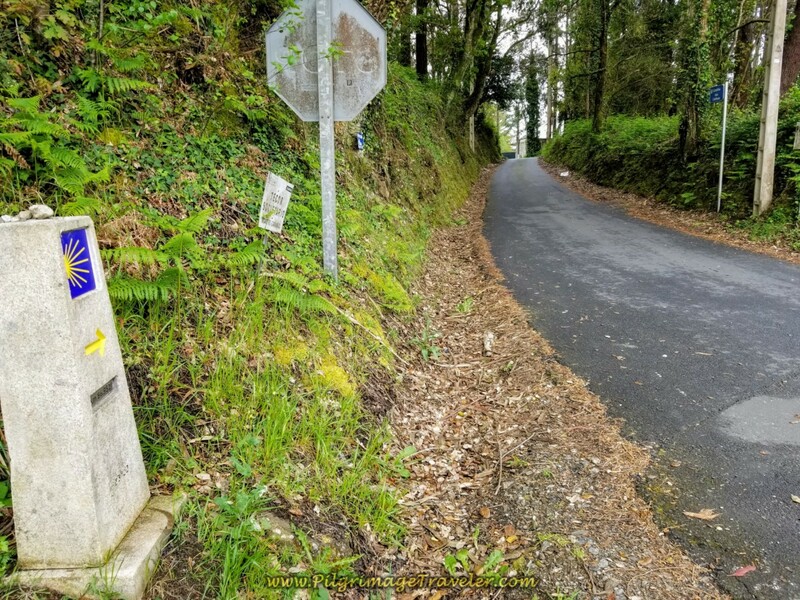 We walked up the hill towards the sign and onto what is now known as the Rúa Fonte do Campo. Still climbing, we walked past the 94.5 kilometer marker, with a view of the estuary behind it. 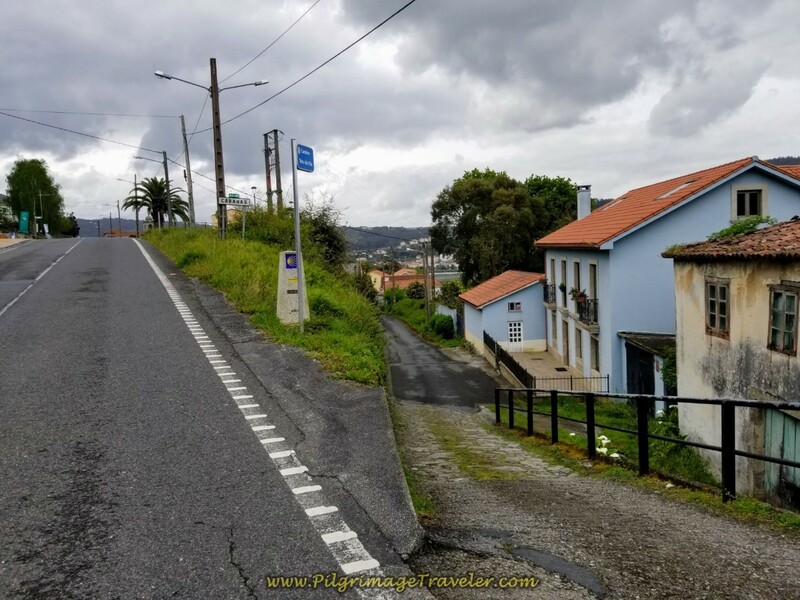 There is another 700 meters or so of nice flat walking along the top with continued open views on the Rúa Fonte do Campo. 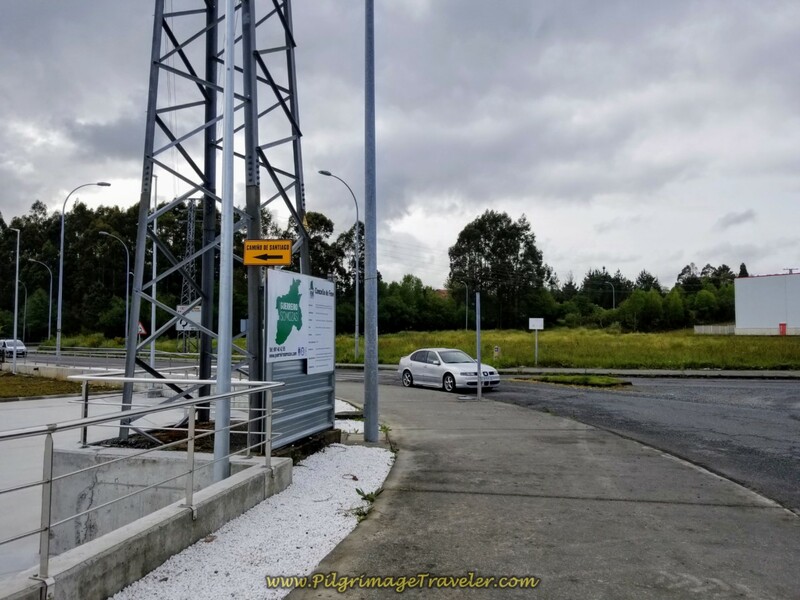 Then it is a left turn on a bit of an uphill and onto the Camiño Casanova, where we came to the sign for first town of Casanova, shown in the photo below. 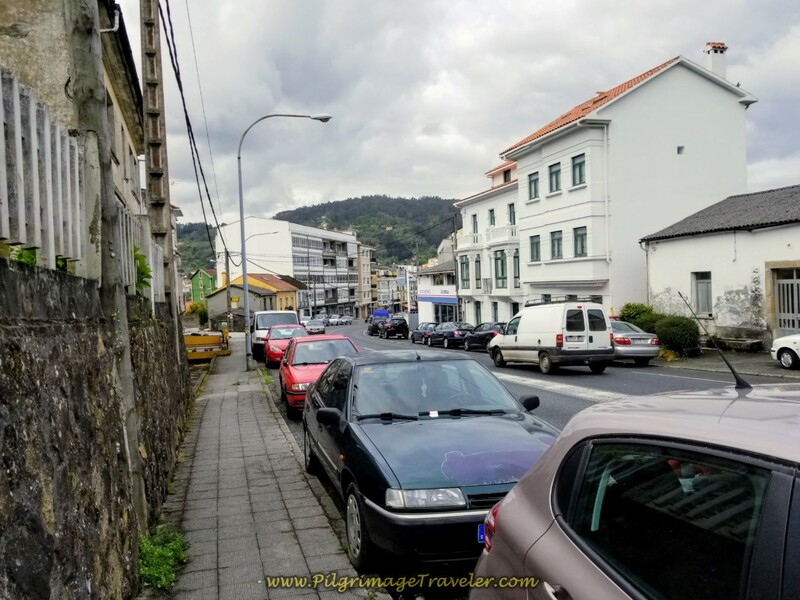 Then it is a mere 400 meters down the Camiño Casanova as you are directed down a hill and into the center of town of Fene. You come to the intersection for the main street, the N-651, shown below. Across the street, is the Café Lembranza. Since we were only about 5.0 kilometers into day two on the English Way, we continued onward. 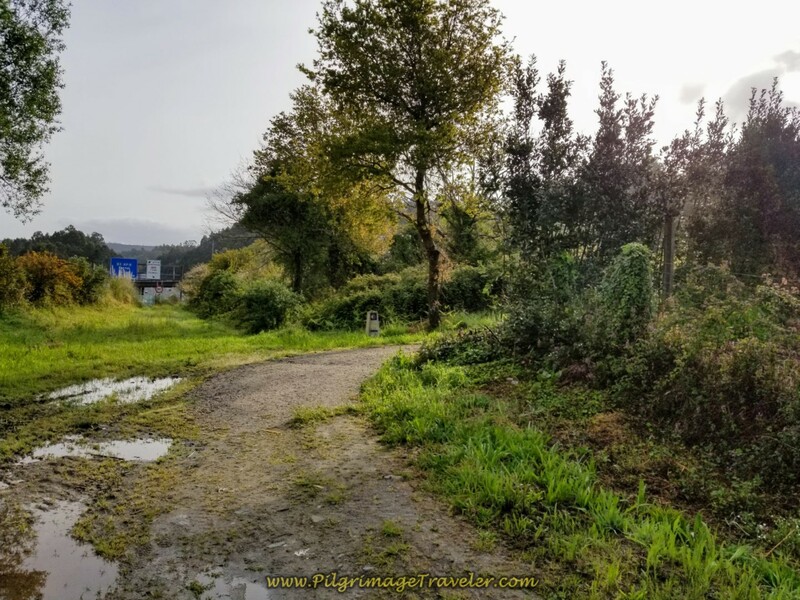 On my first trip through here, my Camino partner and I stopped and had a very nice coffee break here. 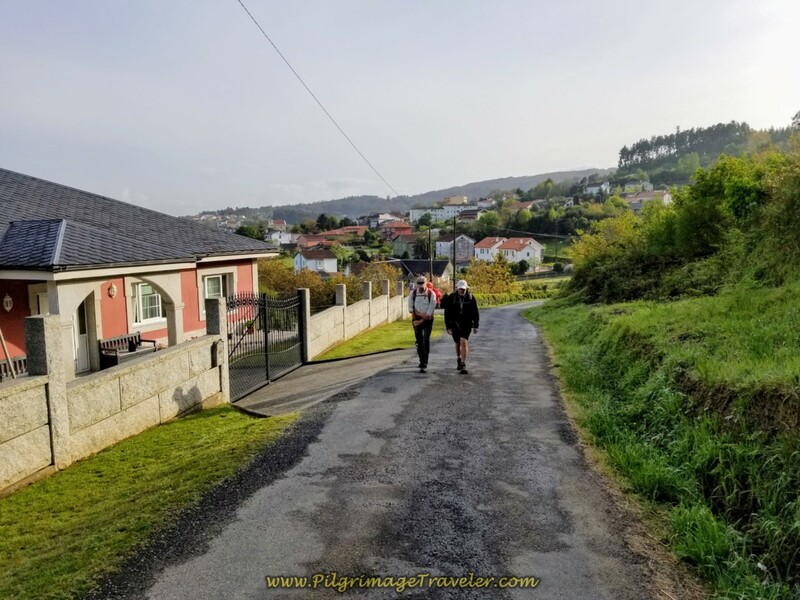 The Camino crosses the N-651 and heads due south, jogging through town a bit, then straight south on the Rúa Alcalde Gerardo Díaz as it begins a gradual climb. 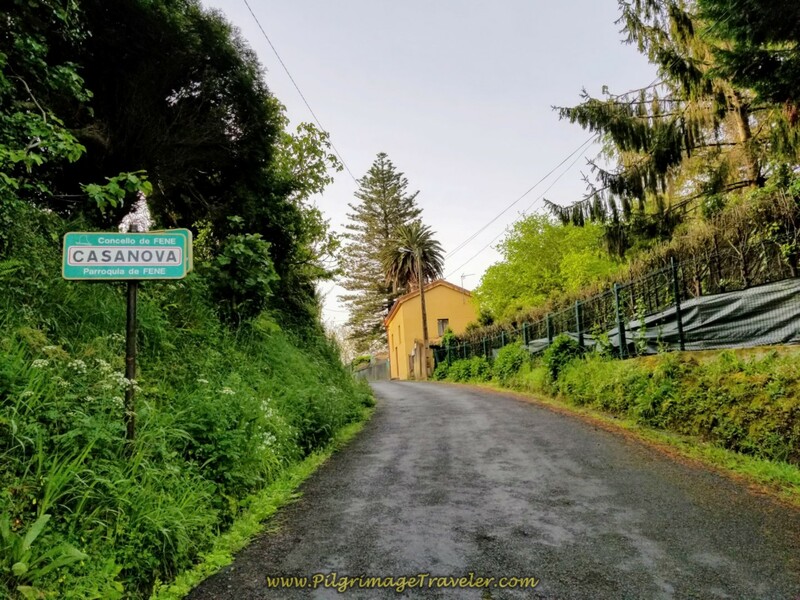 After less than a kilometer, the climb begins to steepen as you walk through the village of Chamosa. 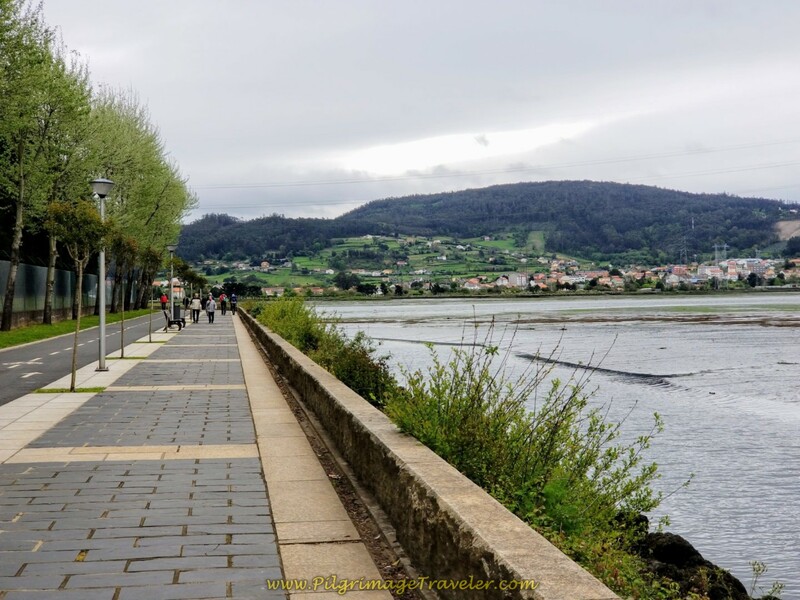 Here the Way joins the Rúa Travesa. 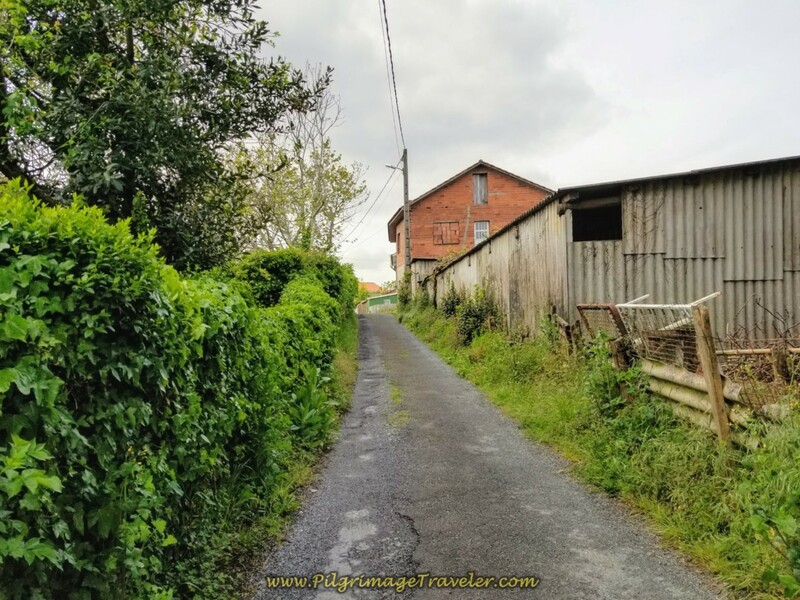 As you walk farther south, the Way becomes more rural. 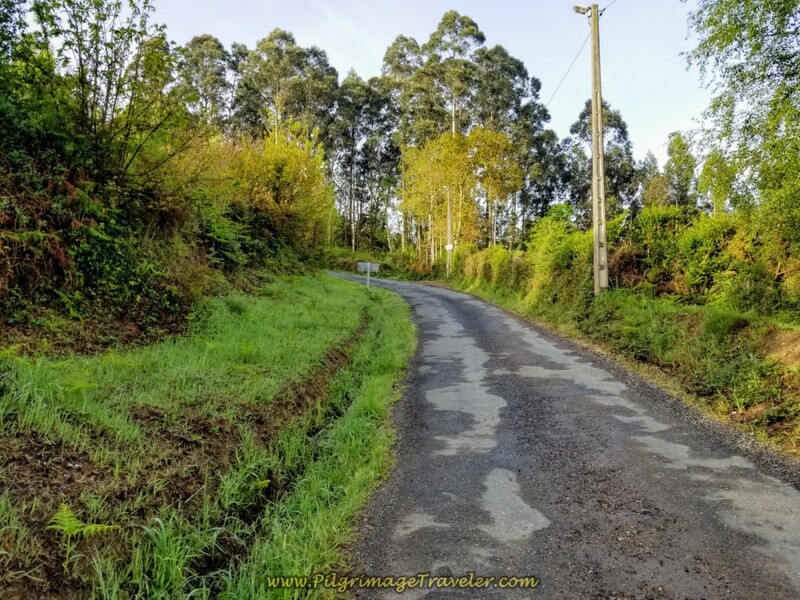 As you leave the village of Chamosa, the rural road becomes much more steep. After a tad more than 1/2 kilometer you leave the road and turn right on the path shown below. It is another 1/2 kilometer on the dirt path until the top, for a total of about 2.0 kilometers on the climb thus far. Not that bad, eh? You walk on this path next to the E-1 for about 1/3 kilometer. It was rather muddy when we passed through, but improved farther along as you can see in the next photos below. The path walks under the E-1, pops out on the other side, shown in this photo below. I would have preferred not to walk near a very busy highway, but I suppose if we had to cross over it, this wasn't a bad way to do it. In a very short way from the other side, we turned right onto a lane that runs parallel and below the N-651. Walking onward about 300 meters, we came to this intersection, below, and crossed over the road, the DP-3505 to continue to follow the lane. We are still climbing a bit, but since the E-1 crossing it feels much more gradual. After 200 meters more, this sign directed us to turn right and follow the lane shown in the photo below. This is another "provisional detour." 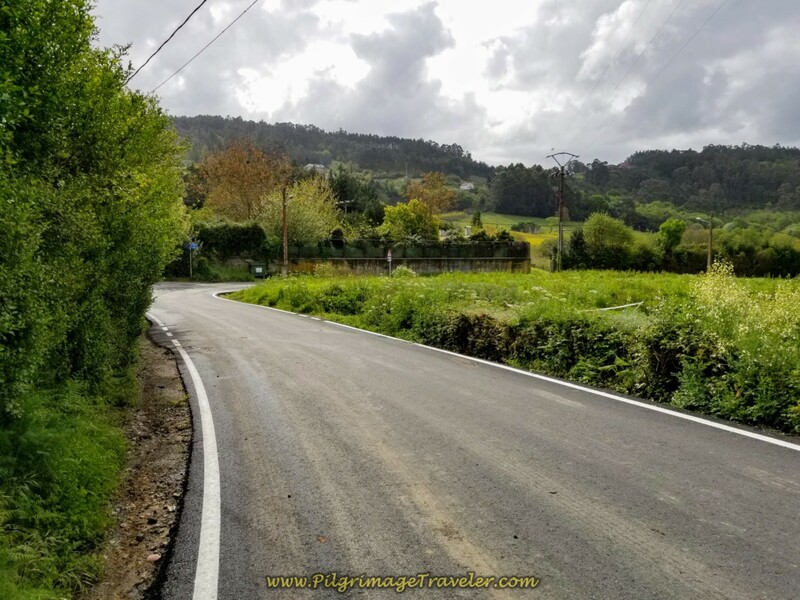 When I look at the map above, most likely the Camino will continue on straight here in the near future as improvements are made on this section. 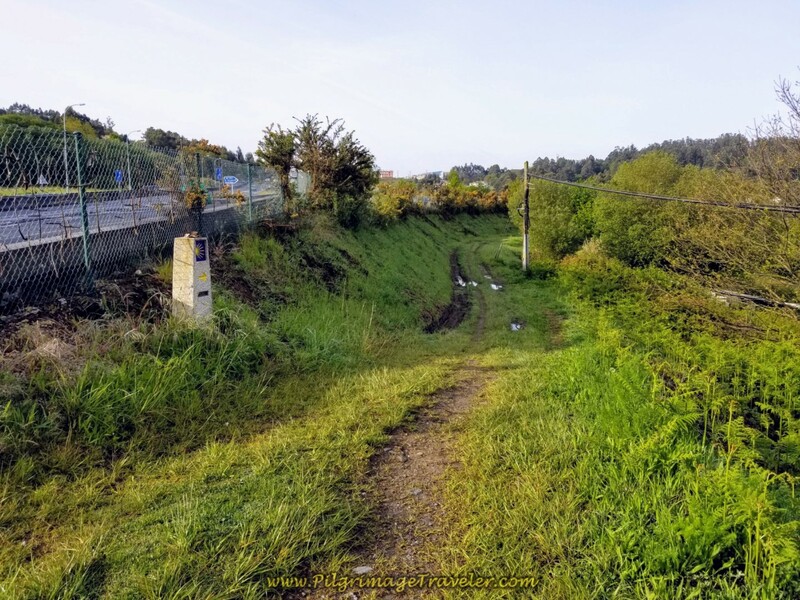 Several hundred meters uphill on this muddy lane and we arrived at the intersection below, in a major industrial area in Vilar do Colo. We turned left here. 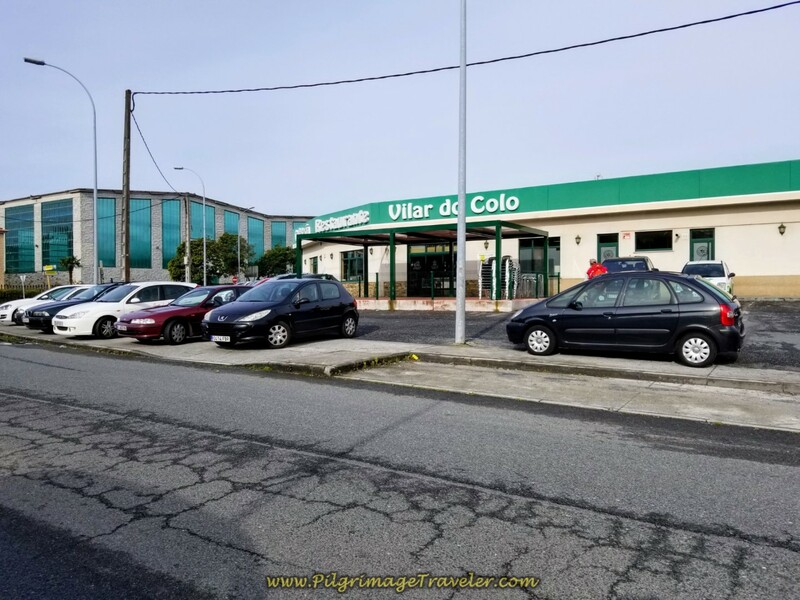 And when we walked by this place in a few more meters, the Café Vilar do Colo, we were more than happy to seize the opportunity to take a break and have lunch, about 10 kilometers into our day since Neda. This place is a major truck stop and they also have a nice convenience store to get snacks for your pack if needed. We took the opportunity to stock up our packs with nuts and energy bars. 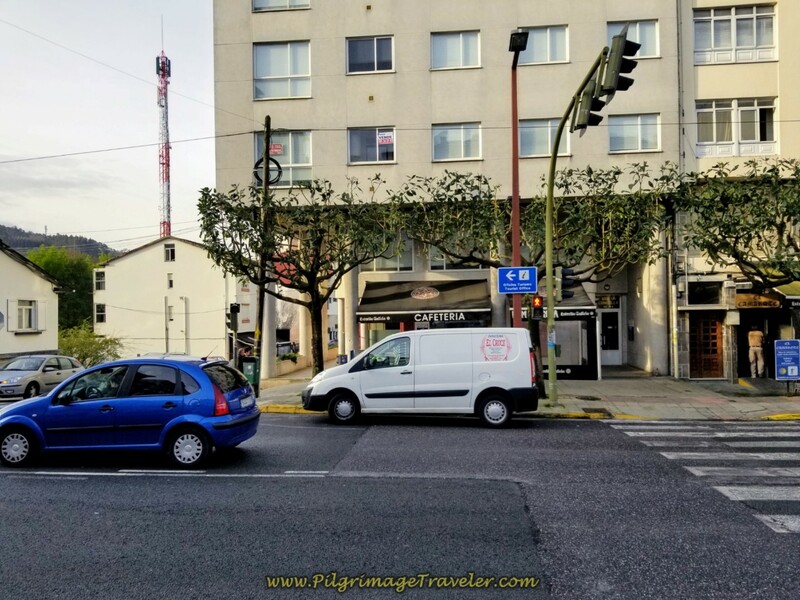 The restaurant is on the corner of a large intersection, so after our lunch break, all we had to do was find the yellow detour signs again and take a left at this roundabout, onto the VG-1.2. 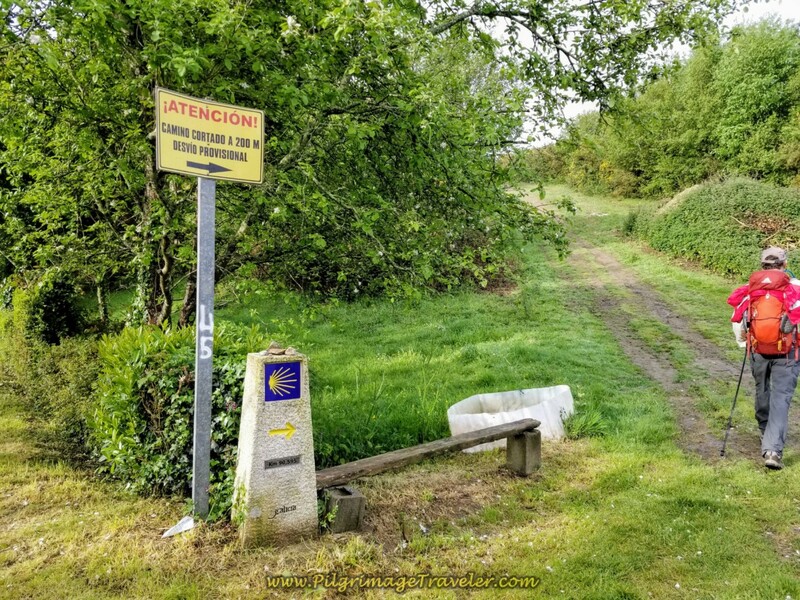 In several hundred meters more, the Camino goes right and onto the N-651 once again. You may also be able to see in the photo below, the next blue Camino sign directing the next move to the left. A left turn off the N-651 puts you on this nice side lane for about 400 meters. 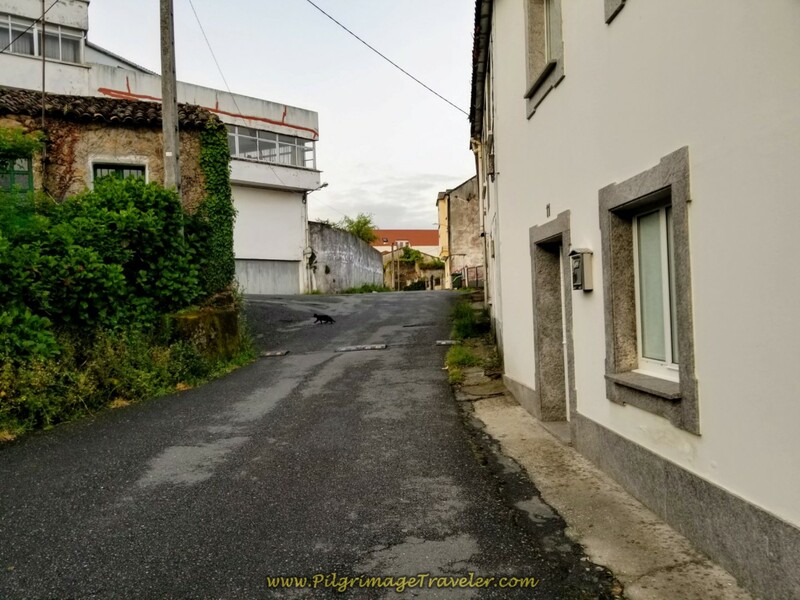 But alas, we rejoin the N-651 to walk into the town of Pereiro. 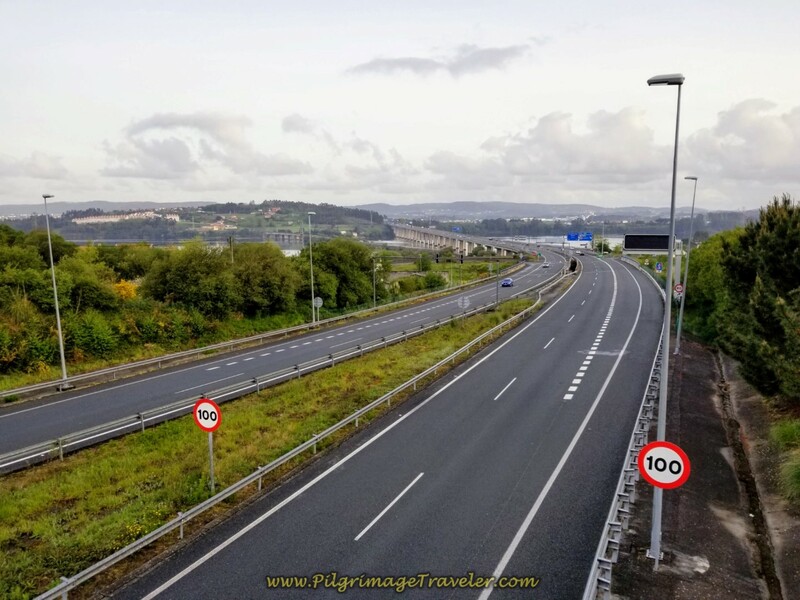 The Camino Inglés on day two only stays on the N-651 for about another 400 kilometers, before turning right onto another path, also shown below. 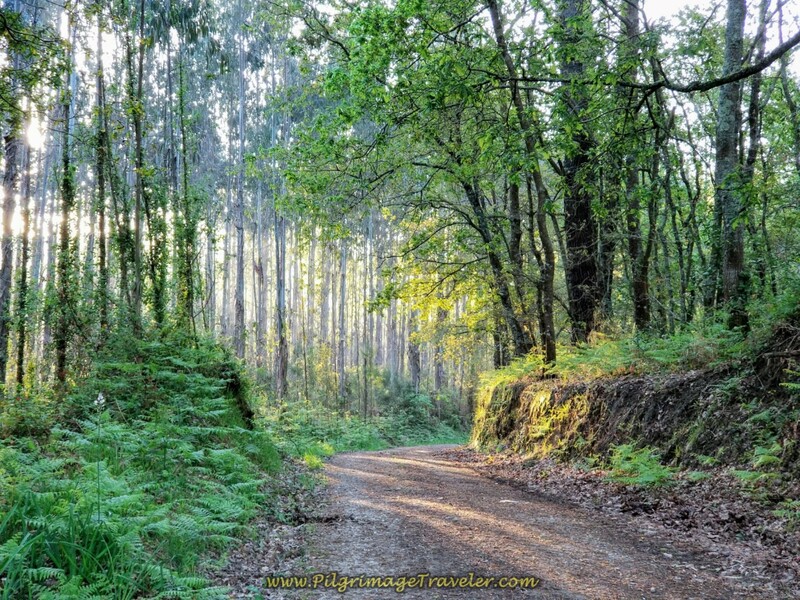 The path is a short-lived 1/3 kilometer, where at its end you pick up the Camino Feal to the left. That is the E-1 ahead, that you walk under on this street. As you walk under the E-1, a sign identifies that you have just walked into the next town of O Feal. 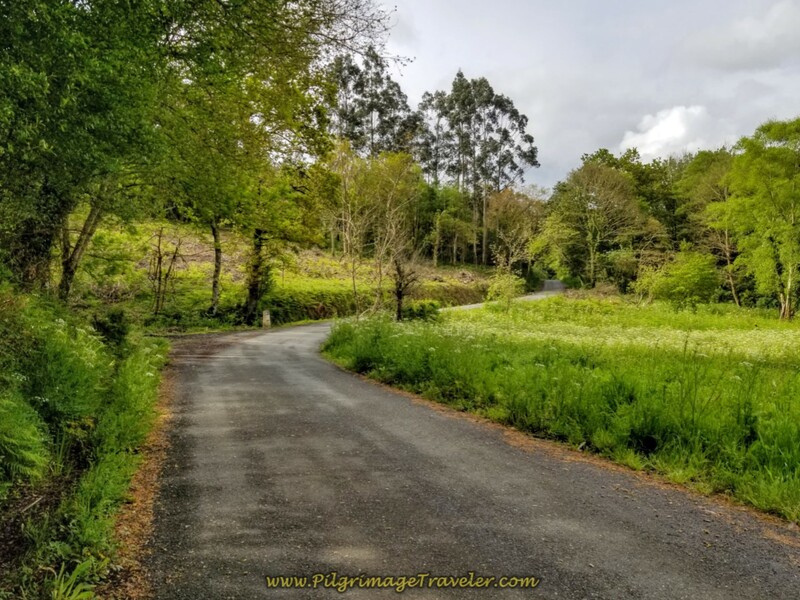 You meander around the countryside on the Camino Feal for the next 1.5 kilometers until you meet up again with the N-651. 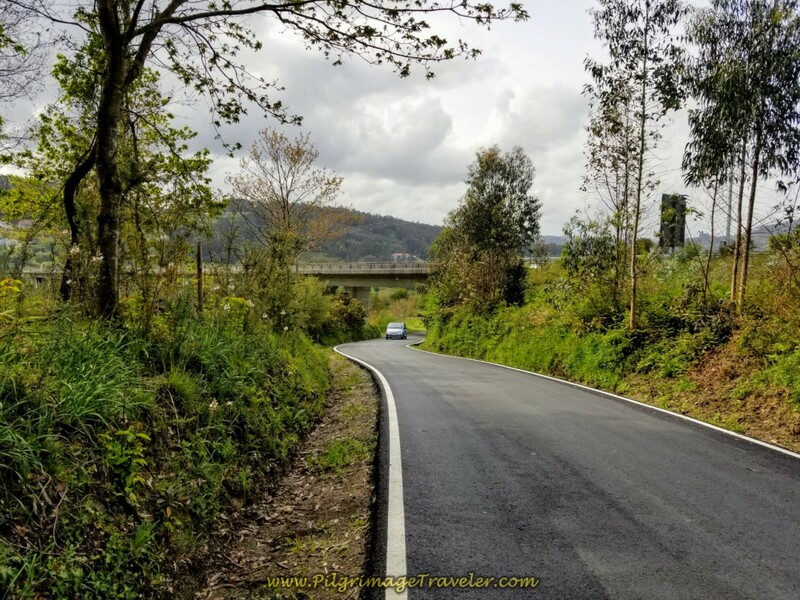 Just after crossing the N-651, and continuing straight on, you see this kilometer marker and the road becomes the Camiño do Cadivas. 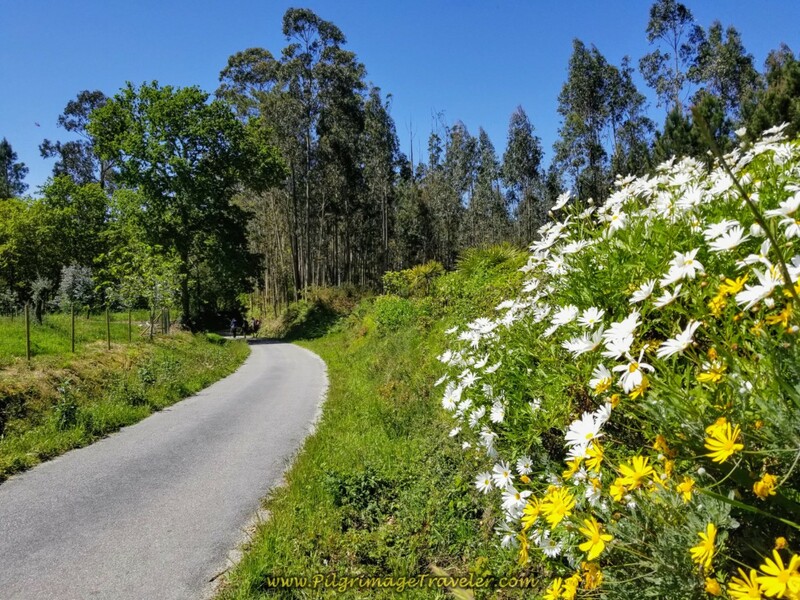 The 2/3 kilometer walk along the Camiño do Cadivas, though paved, is pleasant and quiet and very rural for being so close to Pontedeume. Then you come to a wider street, shown below, and cross over it, to stay right and walk onto the lane instead. 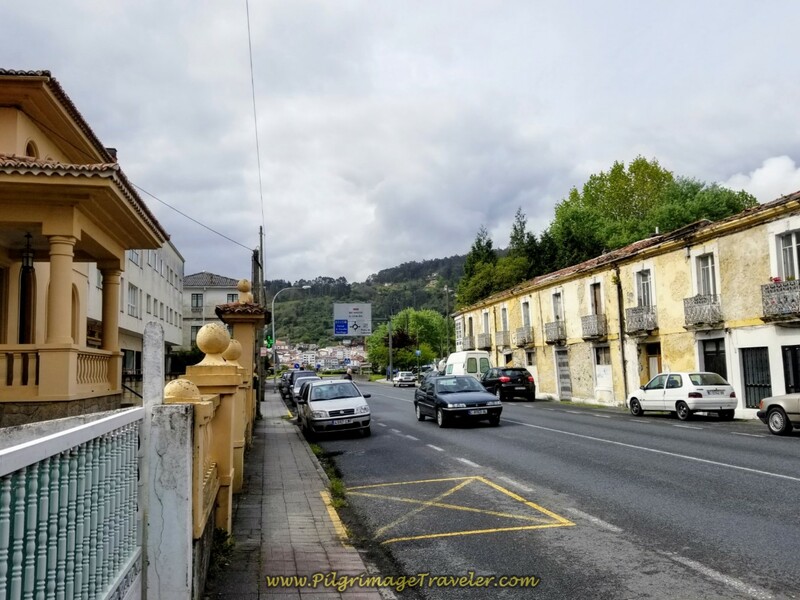 You are now entering the next town of Cabañas on day two of the English Way. Almost there! 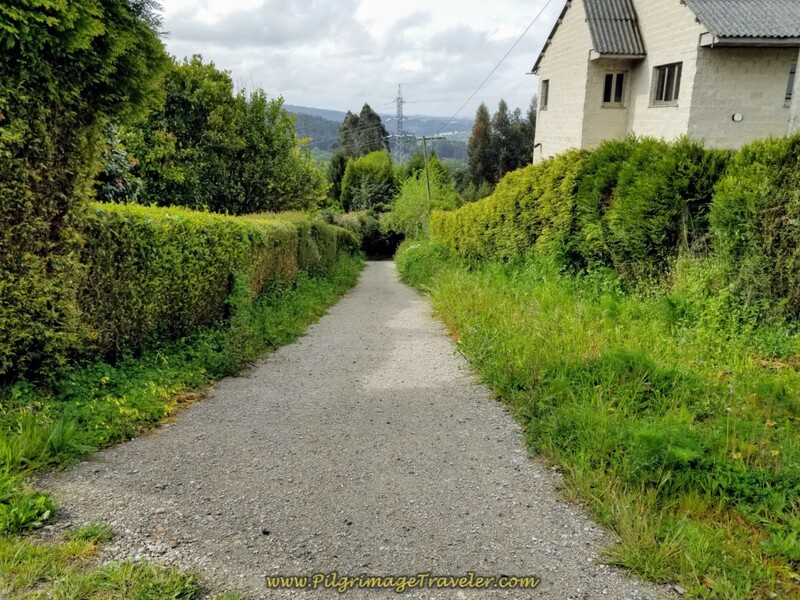 Then the nice descent toward the Eume River becomes steeper. 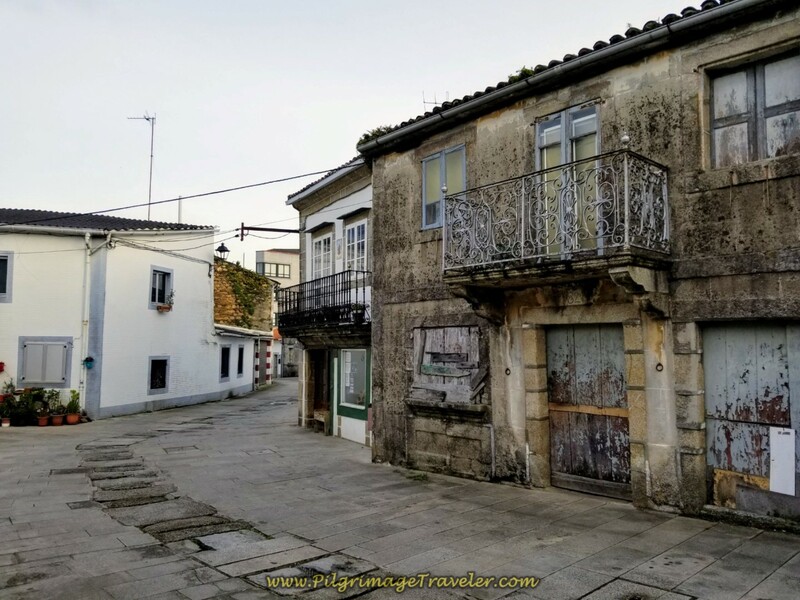 Notice the grey granary, called an "horreo" in the next photo. 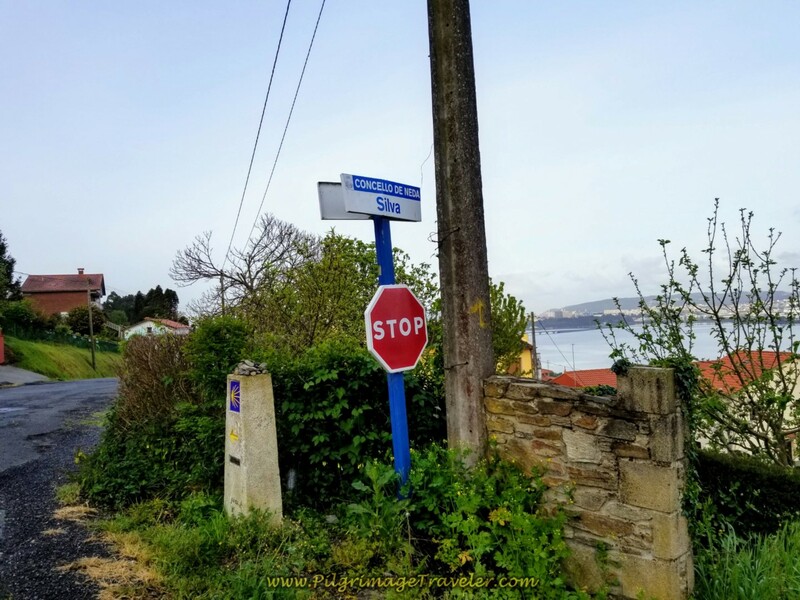 In another 1/2 kilometer, the Camino comes to the N-651 and turns left here. 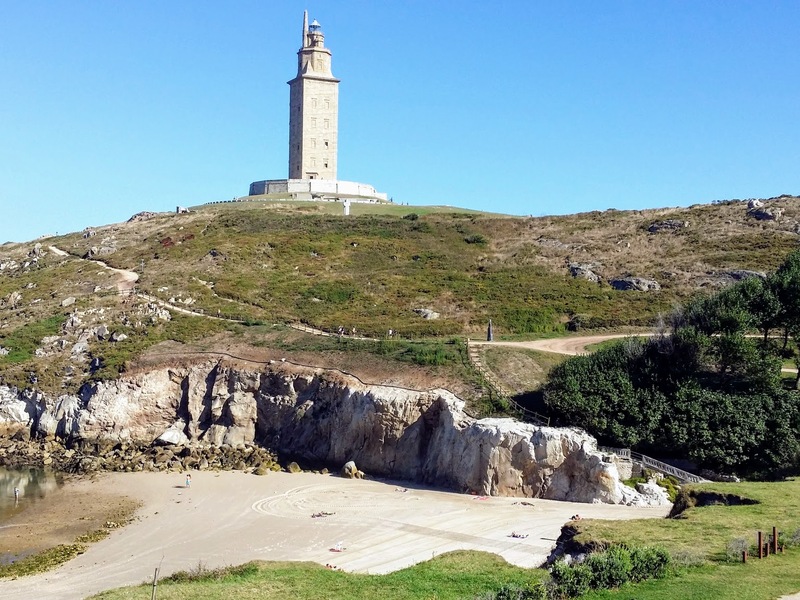 In 2/3 kilometer on the N-651, come to the roundabout by the Parque de Cabañas, shown below and walk straight on towards the bridge. 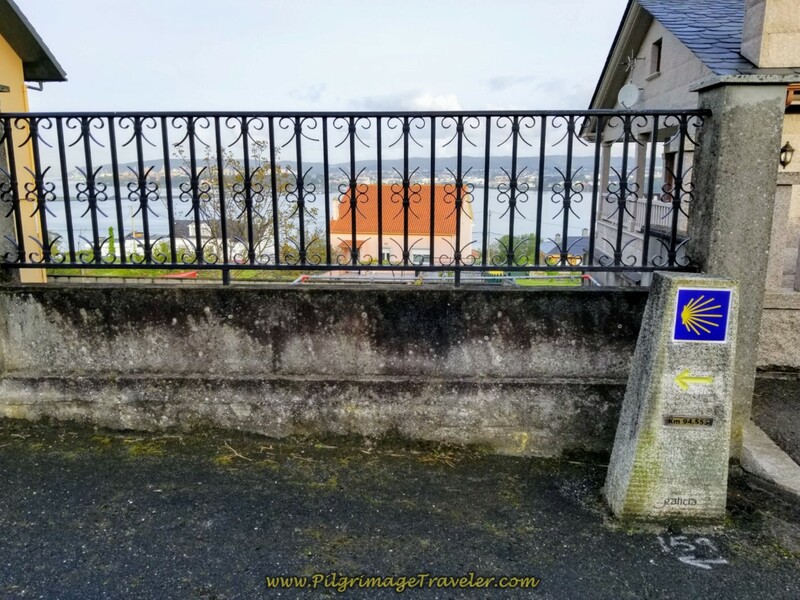 The only thing that separates you and Pontedeume at this point is the bridge across the river. It is a long 1/2 kilometer walk across the bridge. 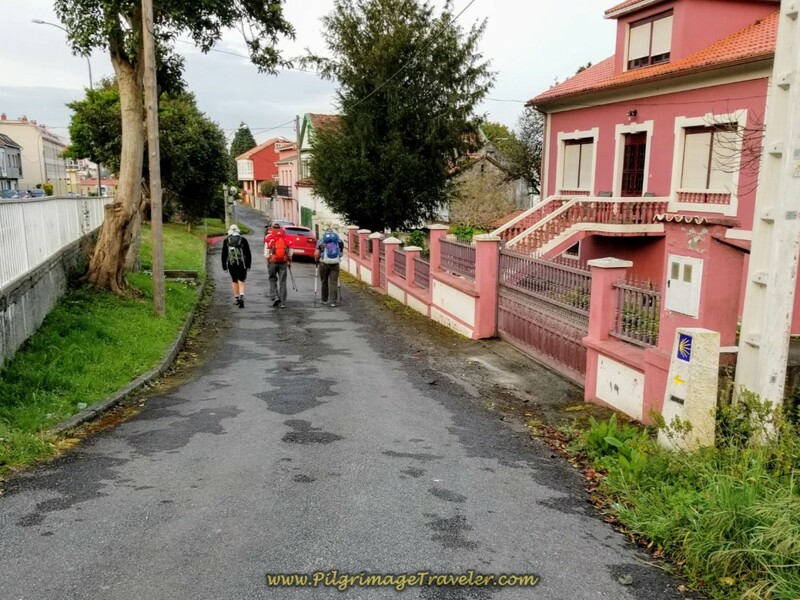 The first time I walked it, it was to end the long first day's stage from Ferrol. I thought the bridge went on forever! 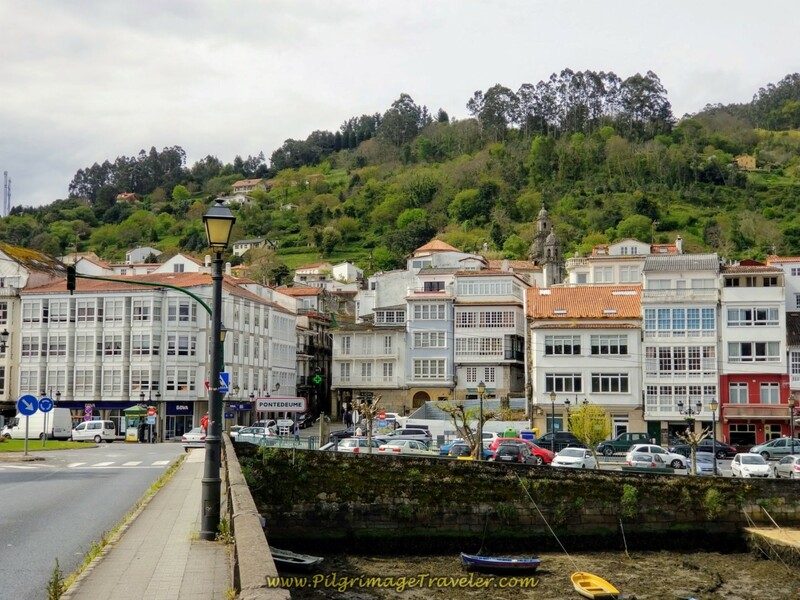 The Albergue de Peregrinos de Pontedeume is in the long, orange-roofed building that you can see on the right side of the photo, below, directly above the boat. 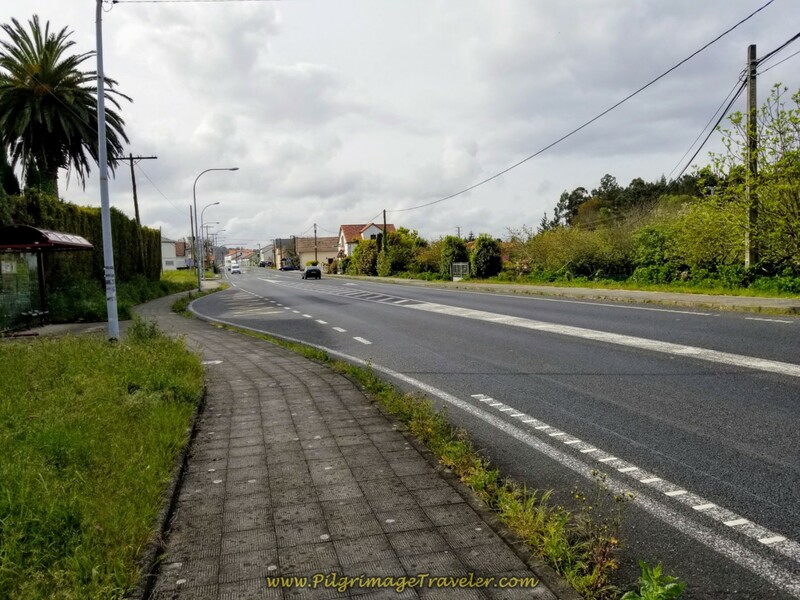 When you cross the bridge and reach the roundabout, take the first right, walk along the waterfront and arrive at the albergue in 200 meters. It is the 4th door down of the long, stone building. This second time I walked the bridge it went much faster. I was only 14 kilometers into my day this time. What a difference it made on how I felt. 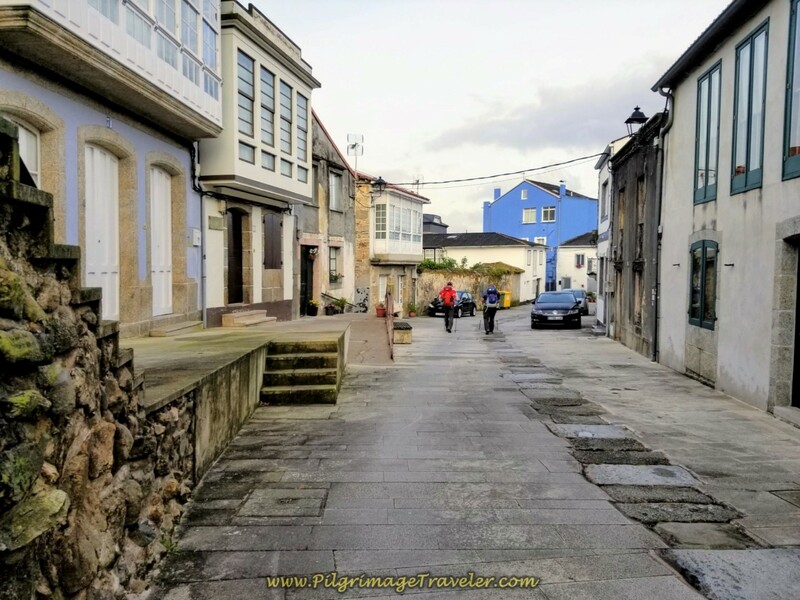 My Camino pals and I did not end our day here in Pontedeume, but walked on to Miño. See day three for this day's adventure. 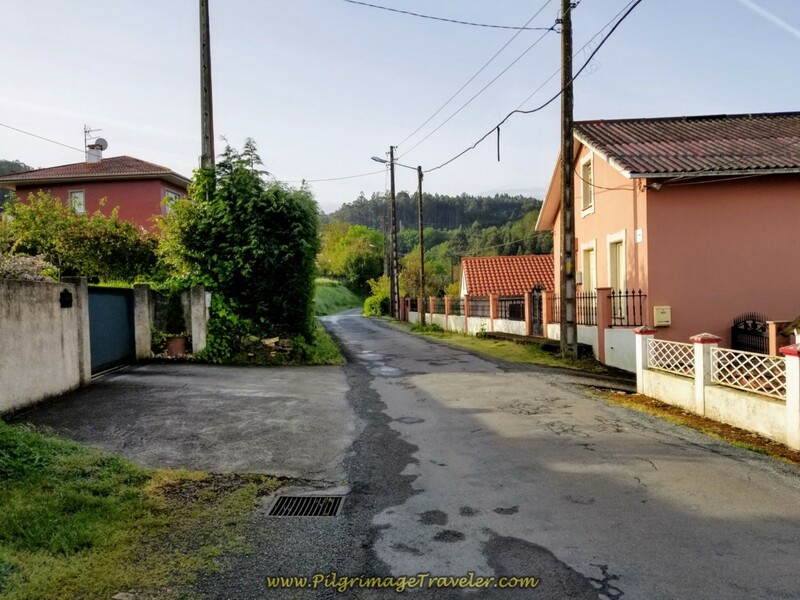 On my first Camino I did stay here, in the Hostal Allegue, a comfortable family-run place, mere steps from the Camino. 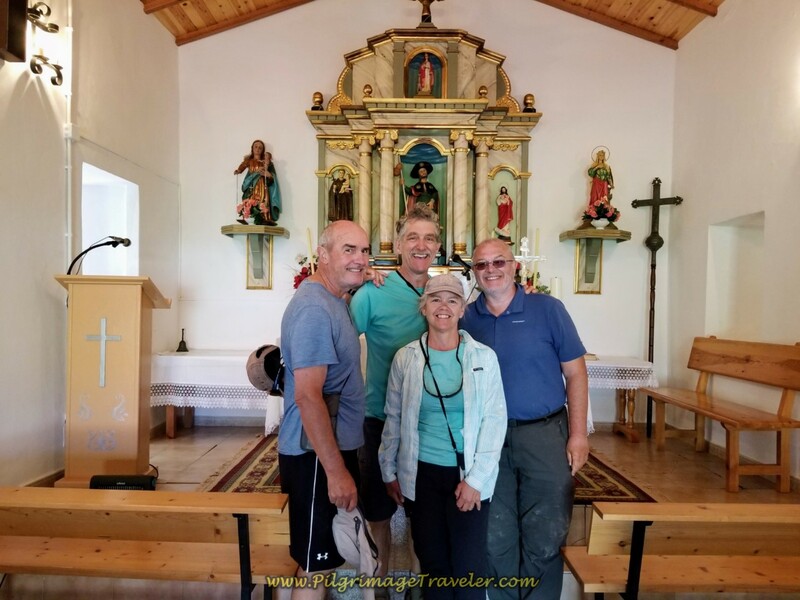 We had checked out the albergue and didn't like the fact that someone was spraying down the beds with bug spray when we arrived! 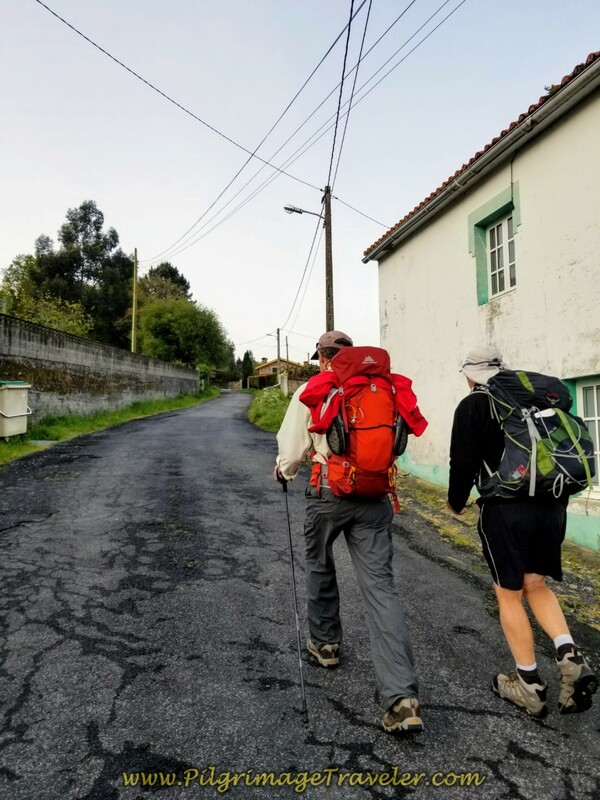 It was my first Camino ever and this scared me! There was also no hospitalero to check in with until eight o'clock. I know now that this is not a problem, that you can still get settled in and then get checked in later with the hospitalero when it is convenient for him/her. Live and learn I guess. 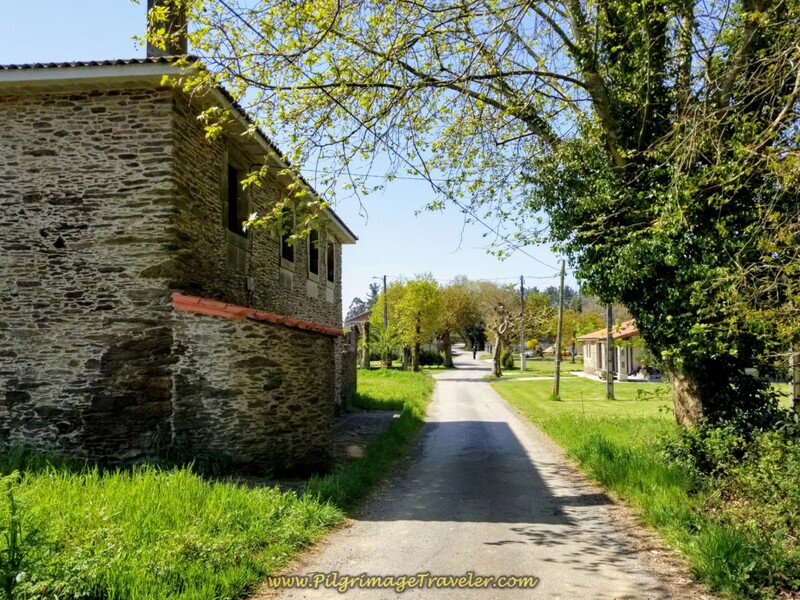 There are several more accommodations available if you don't like albergues. Check my Google map above for more information. Booking.com has none listed for this town. The route has changed significantly from the time I had first walked it. I was happy to see some familiar sights, yet not very sure that I enjoyed some of the other chosen routing. The industrial section on the provisional way, I hope will be more pleasant in the future. 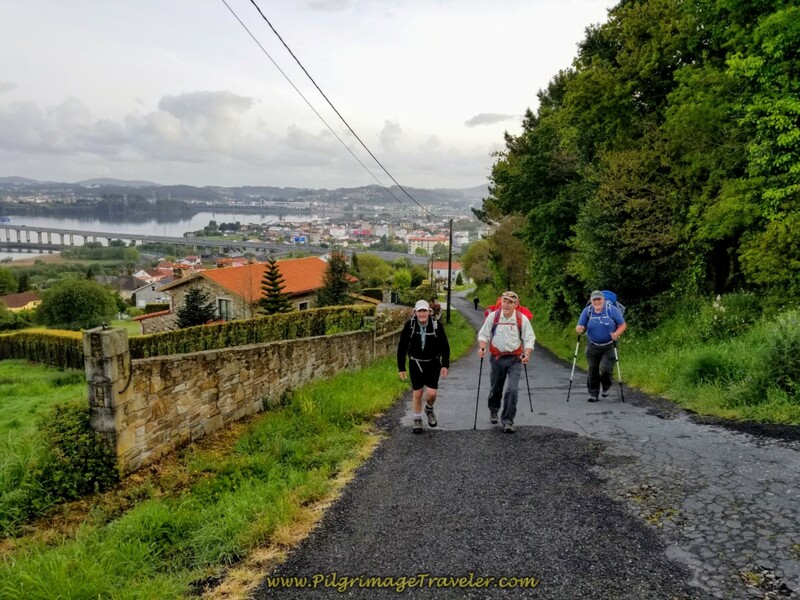 Our friend with Parkinson's was walking strong, despite the strenuous hills so we decided to walk the 10 more kilometers to Miño in the afternoon. He was an inspiration to us! You can see Rich chatting away with him in a lot of the photos, keeping his mind occupied. I am not sure if that was the right thing to do or not, but it appeared to work. 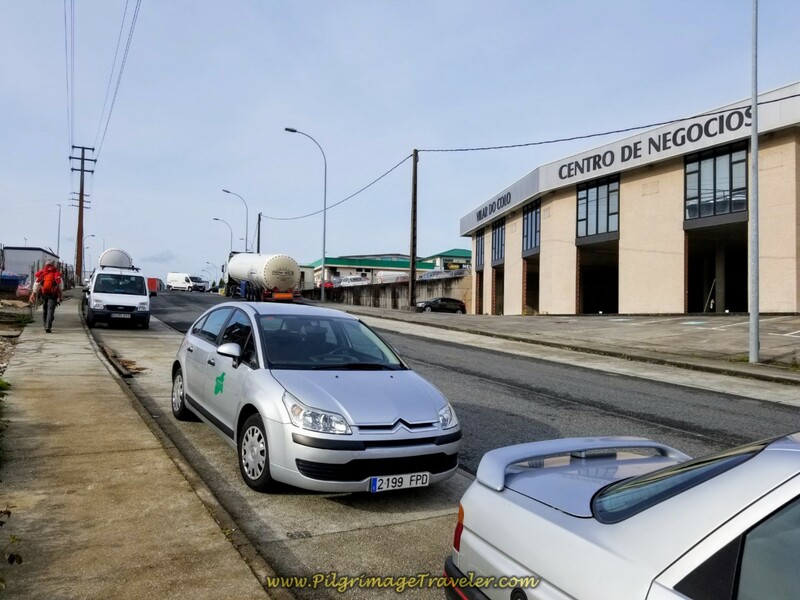 We stopped in Pontedeume for a while to rest and eat ice cream. 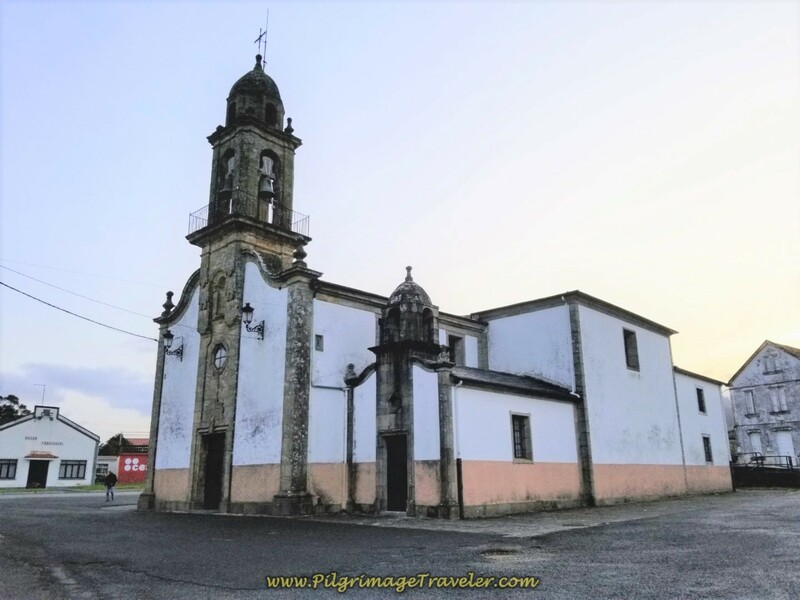 We also wandered off the Camino to see the 16th century Igrexa Parroquial de Santiago, the St. James church. It is a lovely place, but it was closed around noon when we arrived. I have yet to get inside it! See our day three for photos of it. 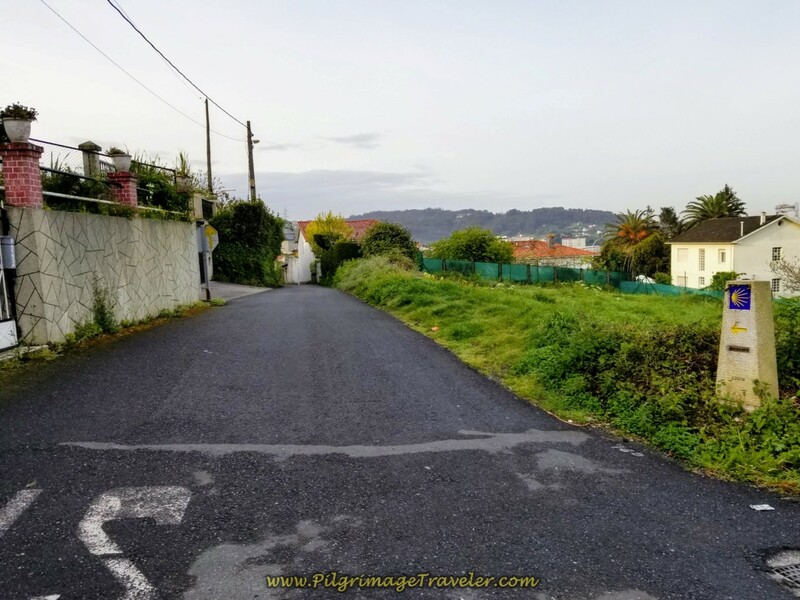 While we did lots of hills on day two of our Camino Inglés, the one ahead out of Pontedeume, from sea level, would be the biggest challenge going forward. The quote above, from Khalil Gibran can be taken quite literally, for day two and most days ahead. It seemed like when you reached the top of the hill, there was always another one to replace it! Thus is the way of the English Way! Thus is life! 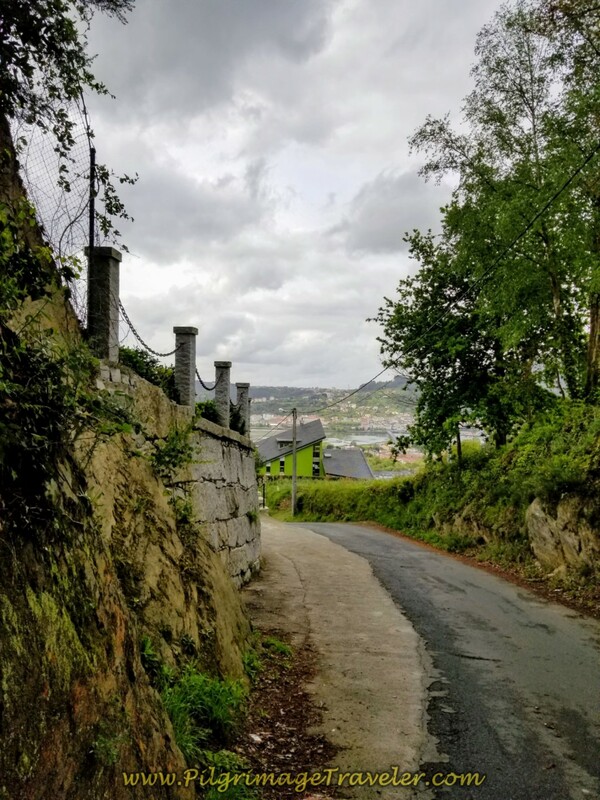 May your own day two on your Camino Inglés be filled with the sweet and challenging song of many hills. May you conquer those hills ~ ready, willing and able to do it again and again! Ultreia!